To kick-off we ordered a bottle of bordeaux (pinot noir) from Le Clementine du Pape Clement 2009,Pessac-Léognan. 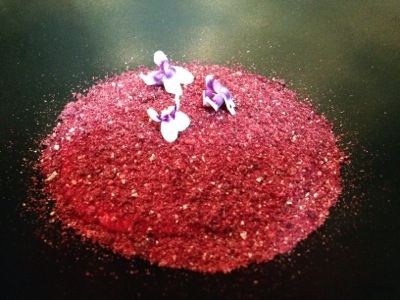 We always order lighter styles of reds to compliment our meals so as not to over-power the cuisine. We are really here to enjoy the food and the wine is only meant as accompaniment! 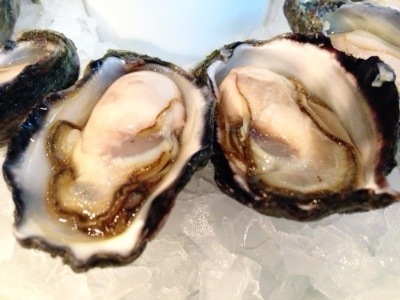 We ordered Oysters for palate starters (optional choice for $60). 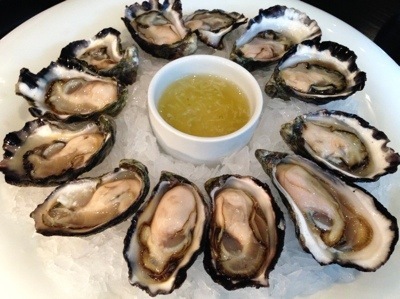 The oysters with ponzu lime juice seriously openned up the tastebuds with the sweet acidic juice to ‘cut’ the very succulent and creamy oysters. This is a solid one bite wonder. 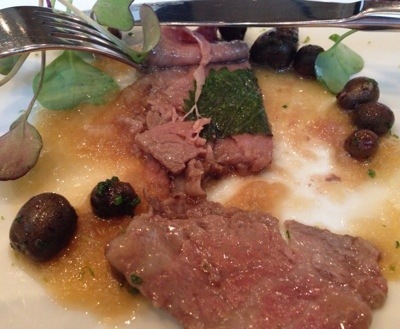 A very dense piece of meat, was thinking perhaps it was cured meat? I didn’t take note of what the waiter was saying as I knew from my previous experience (post here) that I shall be getting the menu later. 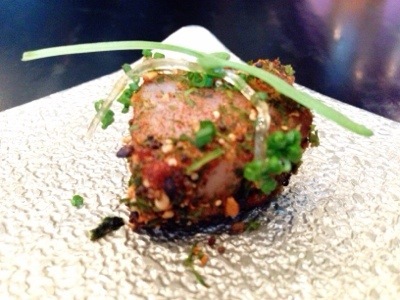 In any regards, it was swordfish rolled in the furikake of flavoursome umami of miso and peppers. 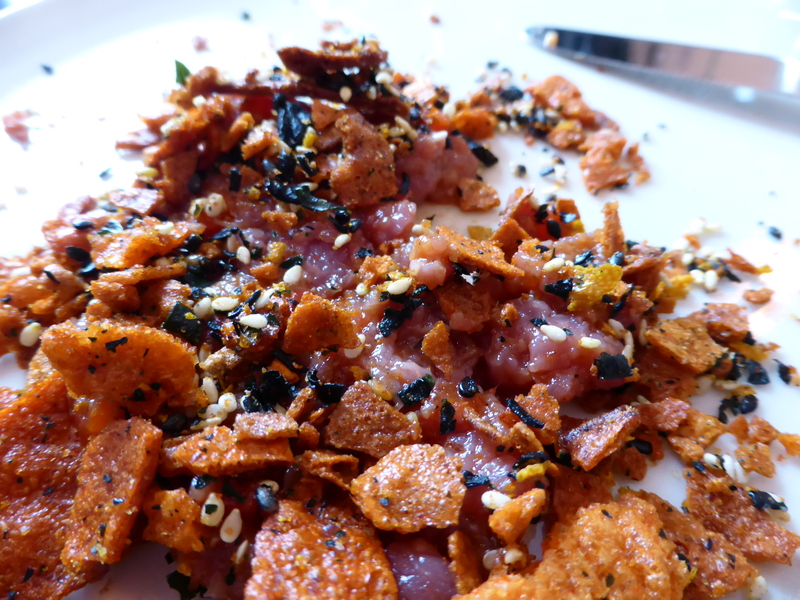 Sheep yoghurt rolled in a sashimi of yellow-fin tuna and sprinkled with green crackling. 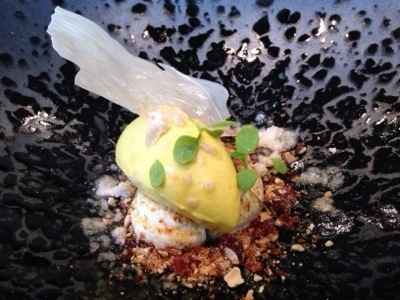 The thick yoghurt and avocado are offset by the acidity of ponzu juice. 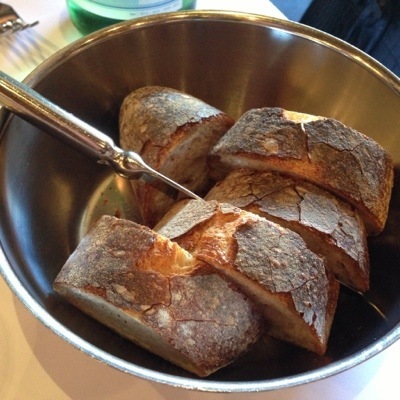 A third into lunch, we were asked whether we would like to take a break by munching on some bread? 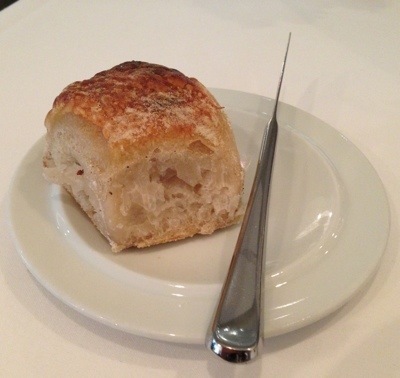 Being carb-phobics, we think not, let the flow continues! 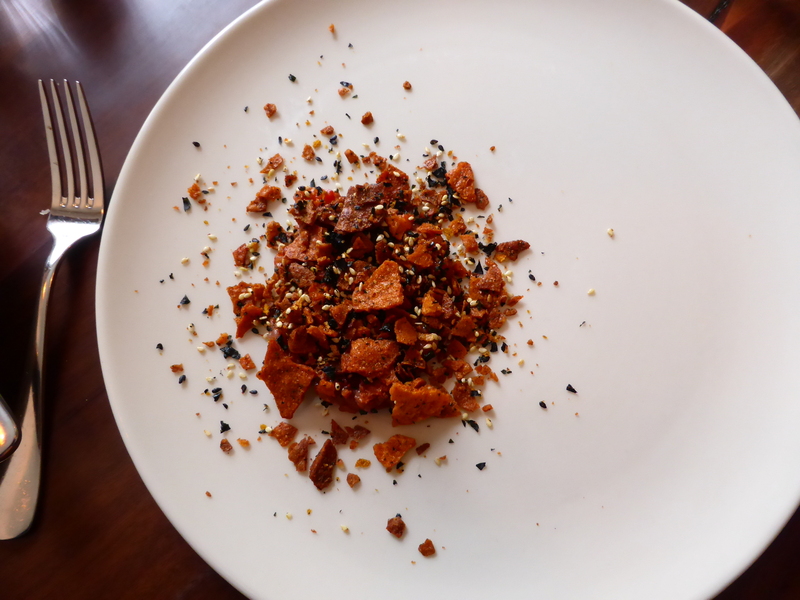 This course reminded me that I have to buy some krill oil to take back to Hong Kong… yet also harkens back to the salmon roe rice at Kikunoi in Japan (post yet to be done!) – so stayed tuned! 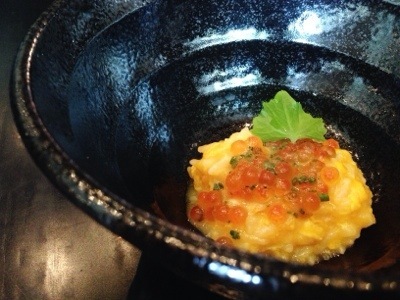 😊 Basically a very rich risotto rice dish with ‘curdy’ egg yolk, topped with the fishy salmon roe. I believe a high skill and superior technique is warranted so not to overcook the egg yolk. Finito! 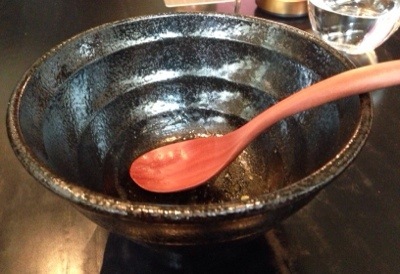 A clean bowl to show how I had appreciated this course! 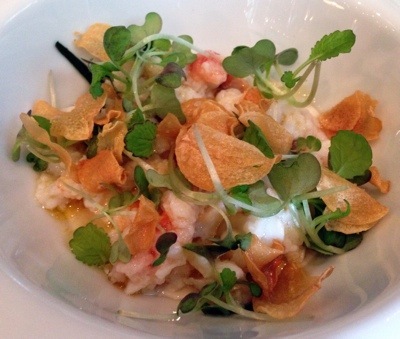 …me, being allergic to shellfish – or rather, crustaceans – had Snapper with Salmon Roe. 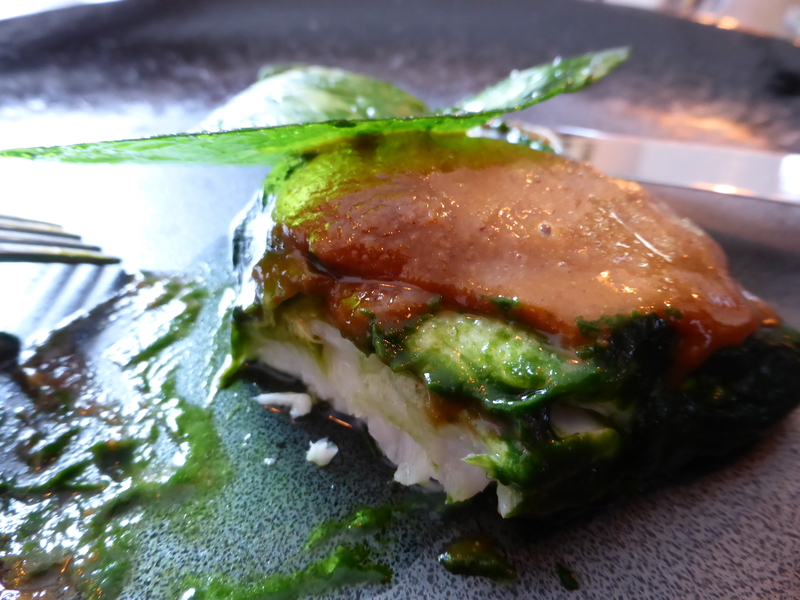 I love the lovely ensemble of colours, but the fish was a bit over-cooked (a little tough) but the tiny dots of jelly sauces are very flavoursome and mouthwatering! 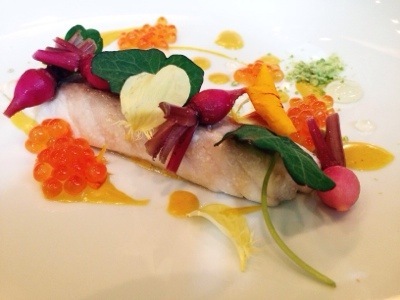 Snapper, Salmon Roe, Jelly, Baby Radishes. This course exudes ‘Australiana’. I like the sourish wonderfully tart lemon taste with a hint of grapefruit. 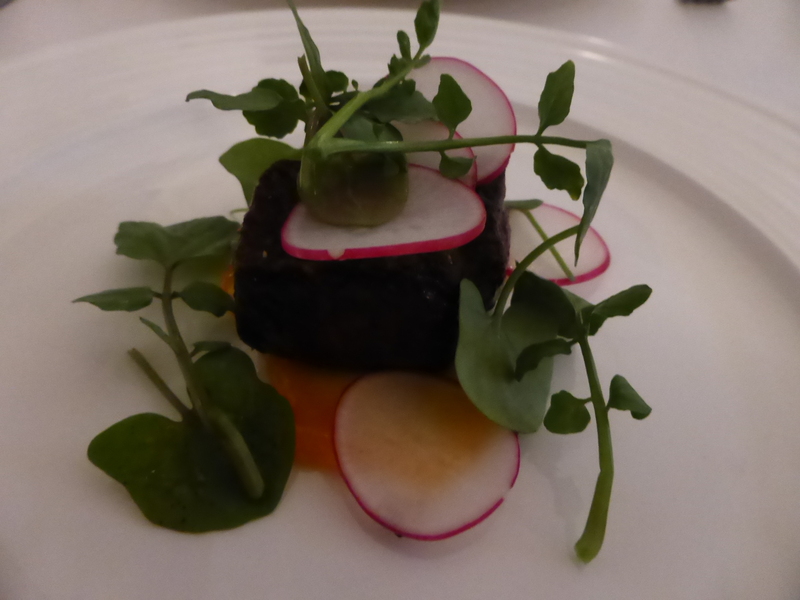 I also loved the red hue of the venison which was very tender. 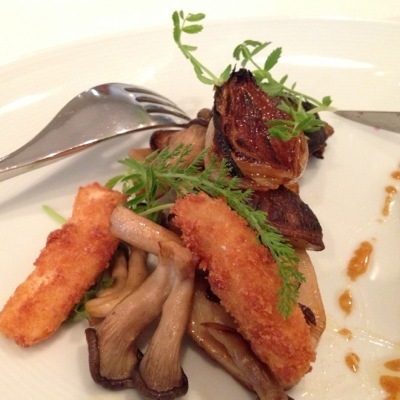 The additional of myoga (Japanese ginger) binds the different elements of the dish well. Optional: Pyengana cheddar, plum wine and apple pectin, sheep yoghurt and apple cream – we didn’t take uo the offer as we were rather stuffed. Well, well, well… this is the first of the 3 desserts. 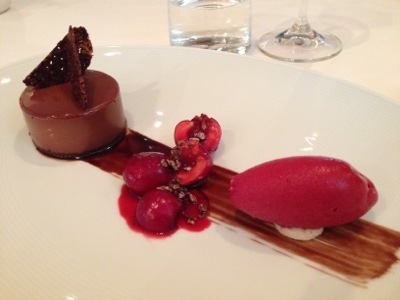 Mmm… presentation looks kind of similar to course #3. 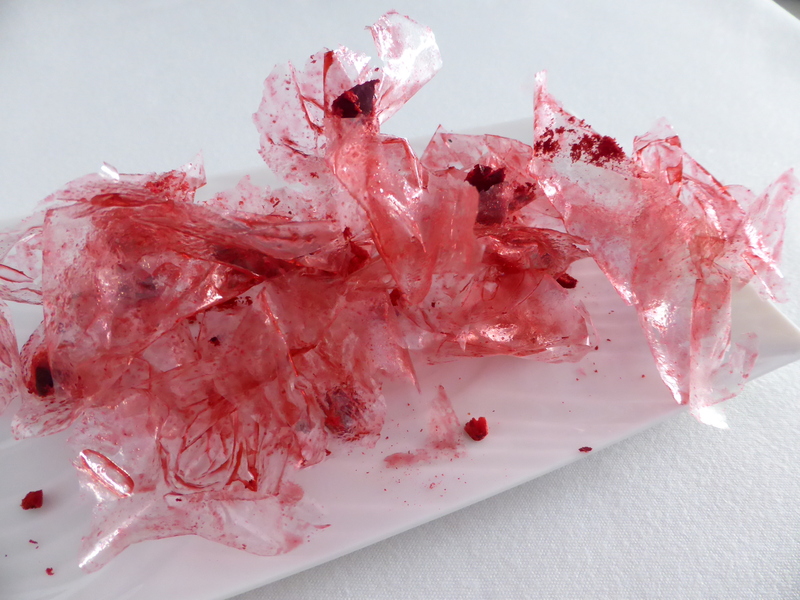 Frozen ice over jelly, pretty good. 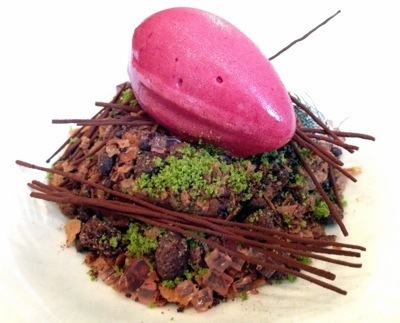 The finale: “Autumn chocolate forest” consisting of soft chocolate, hazelnut and almond, lavender and honey cream, sour cherry sorbet, rose and violet jellies, green tea, liquorice, chocolate twigs. This is Sepia’s signature – and one that I had in my first visit (here). Overall a very Japanoise-skewed meal with literal uses of supplementary Japanese ingredients. 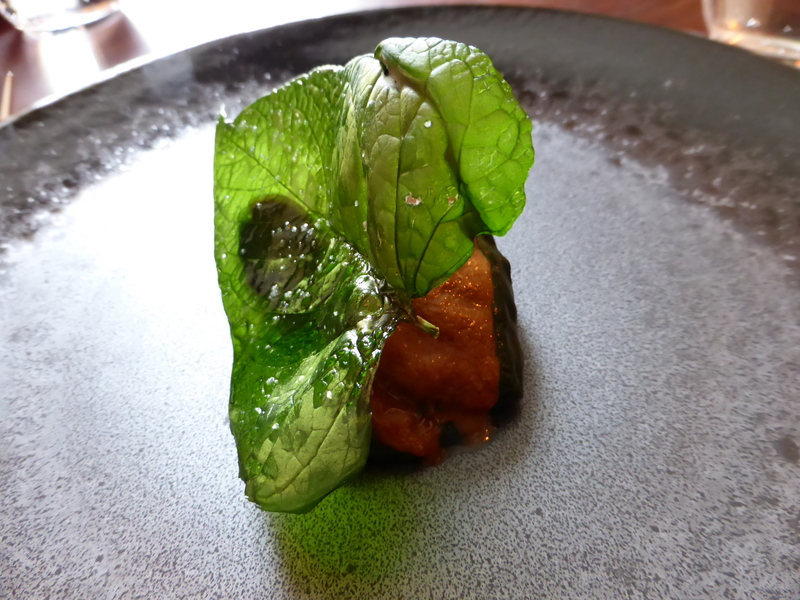 From my first visit last year, Sepia has transgressed from foam and sashimi to mushy curd and cream which is rather fashionable now (see my post on Sixpenny here). Anybody read the November 18 2013, Time Magazine edition – ‘The Gods of Food: Meet the people who influence what (and how) you eat’? There is a family tree where Cafe Paci and Sixpenny were mentioned. 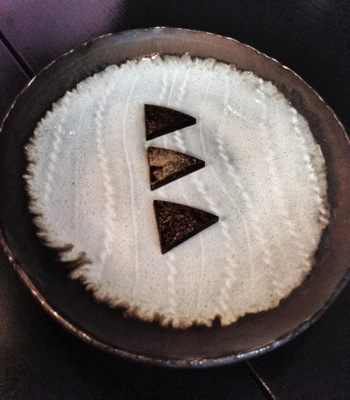 According to the ‘family tree’, Chef Pasi (of Cafe Paci) had both worked with and co-authored a cookbook with Mark Best of Marque – comes from Alain Passard’s branch in L’Arpege, Paris whereas Sixpenny (James Parry and Daniel Peaks) – is an offshoot of Andoni Adurlz of Errentera, Spain who in turn came from the kitchens of Ferran and Albert Adria of el bulli, Pakta, Tickets, Bodega, 1900, 41’s fame. 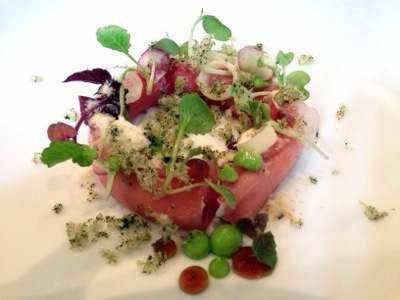 Anyway, on every second Sundays, Sixpenny organises collaborations with a guest chef to shake things up a bit. 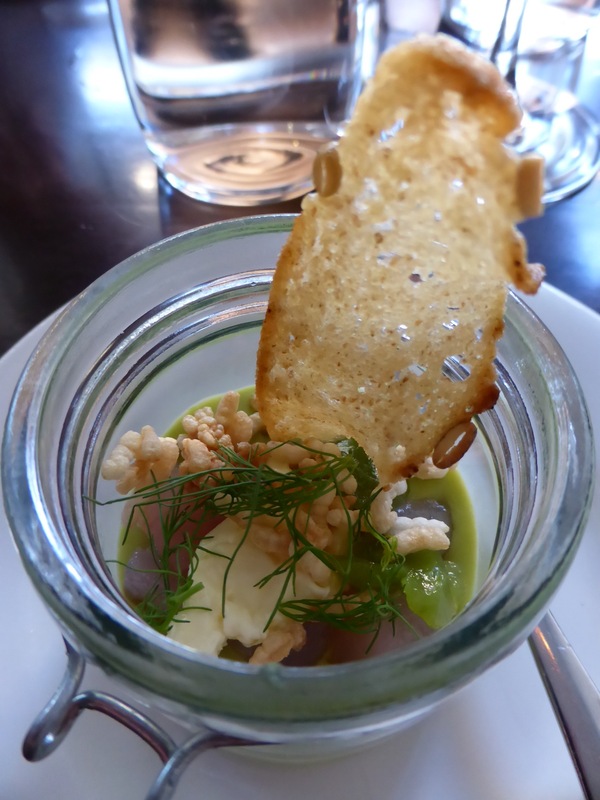 On this particular Sunday I booked, it happened to be a collaboration between Cafe Paci and Sixpenny, thus killing 2 birds with 1 stone at a fantastic deal of A$125 per person! 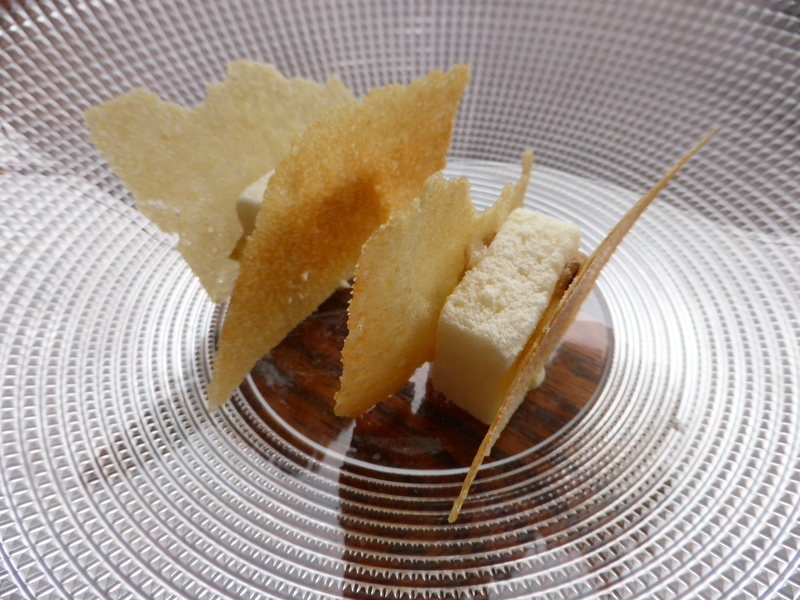 We had 4 Snacks for Starters… For each course, the chefs who prepared the dish will make an introduction. We started off with Cafe Paci (CP), then Sixpenny (S) – whereby, the signatures from each restaurant followed one after the other. Fish & Chips (CP): A neat twist of the good ol’ fish and chips, using Barramundi fish skins and deep-fried thinly sliced potatoes arranged into crackers. 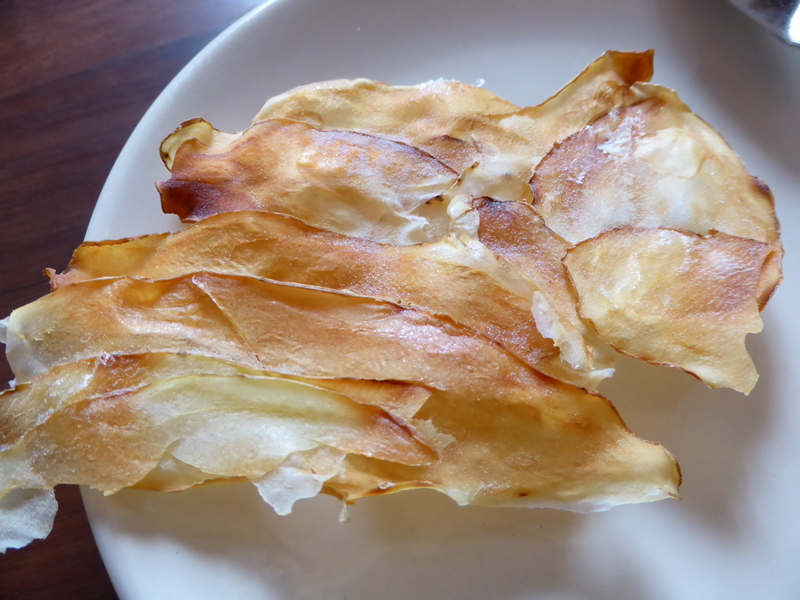 On its own, the fish-skins had no taste, but eaten with the overly salt-and-vinegared potato crisps, taste was liven up. 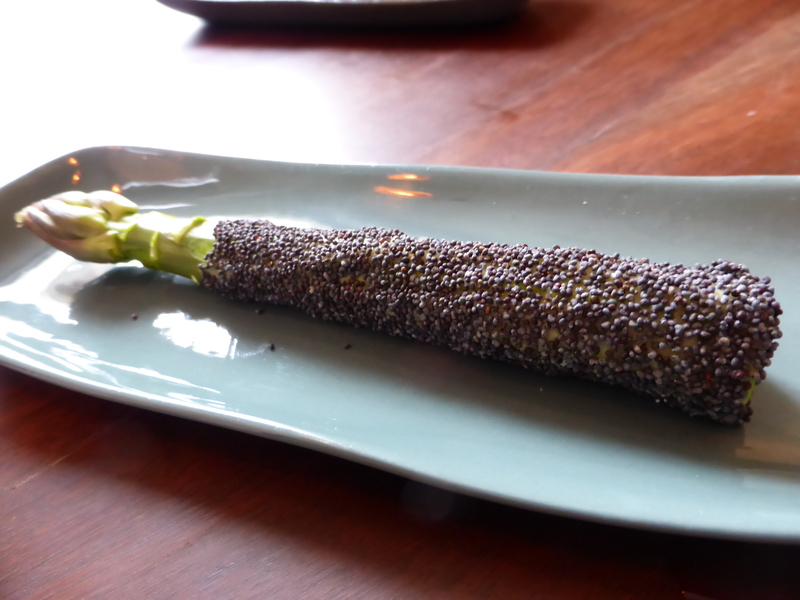 The asparagus freshly picked spear that I had had been coated in lemon curd then encrusted with poppy seeds – very crunchy and delectable! 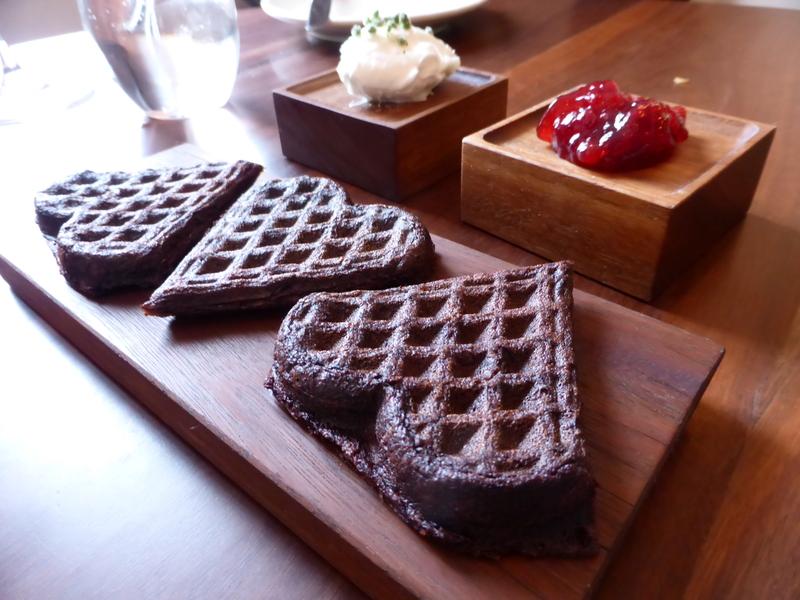 The last of the snacks were the aromatic heart-shaped cutie Blood waffles with the accompaniments of creamed butter and loganberry jam. To drink: Collector Shiraz 2009 Mark Tree Red, although wine-matching is also available. 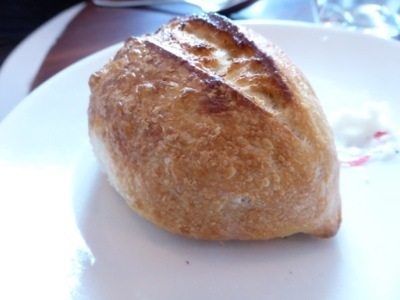 We also had house-baked bread rolls. We were actually getting rather full when the 1st course was served… in any regards…lets loosen our belts and dig in! Something green, something sweet – and something sour to round ’em up! 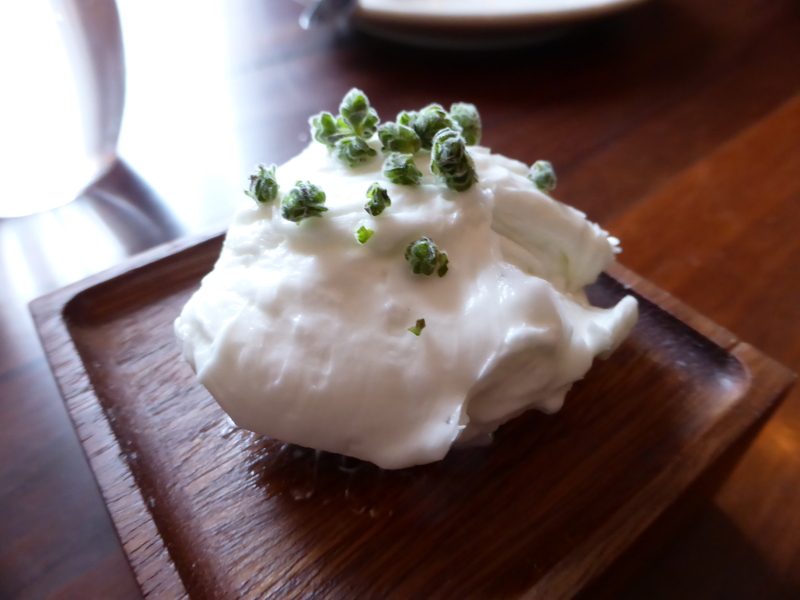 This is from Sixpenny kicked whereby the sous chef came out to pour the refreshingly fragrant pea juice over the snap peas and sour cream curd. 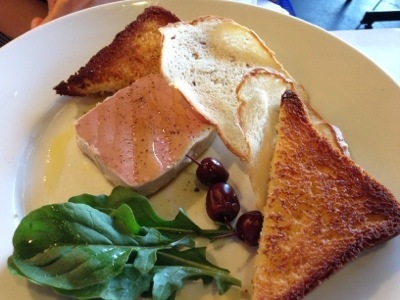 The 2nd course was from Cafe Paci. 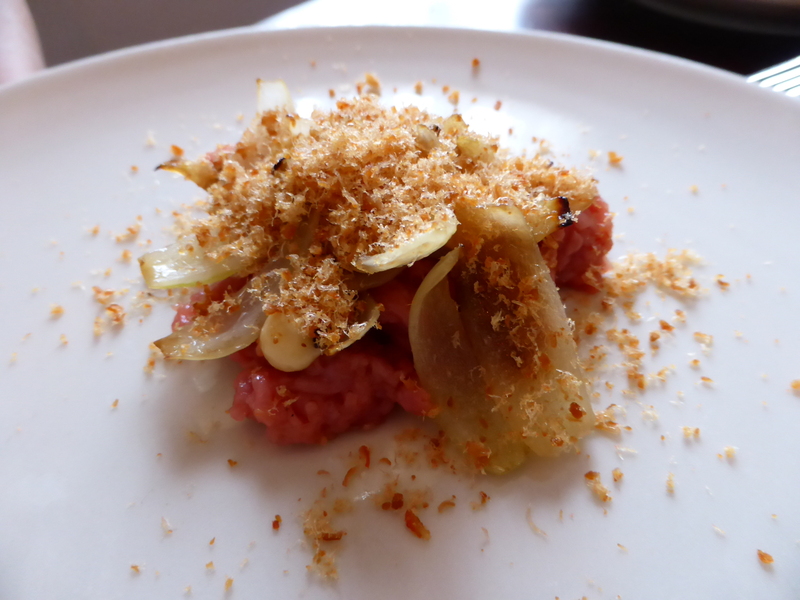 My 2 dining companions had the veal tartare and smoked bone marrow were tossed with dry shrimp prawn floss and prawn roe and onions. 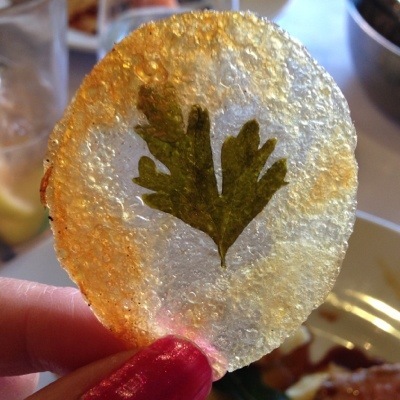 Adorned with a deep-fried sweet potato leaf sprinkled with salt, the blue eye travella was perfectly cooked. The flesh flaking when a fork was pierced into it. 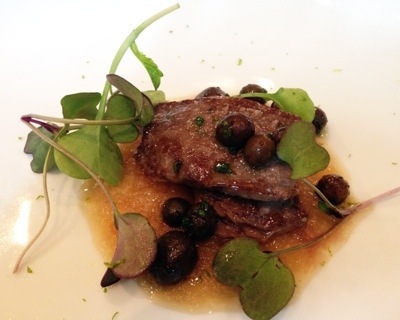 Foie gras on top of the fish and water cress purée blanketed around the fish. 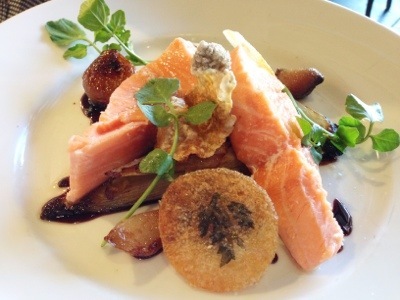 This is dish Cafe Paci is renowned for. A very smart, play-on words of pho (Vietnamese noodles) and potato (potatoes) – hence, potato noodles – a fusion of Vietnamese and Finnish (where Pasi was originally from). The noodles are strands of enoki mushrooms and finely threaded potatoes cooked in garlic butter and vinegar. 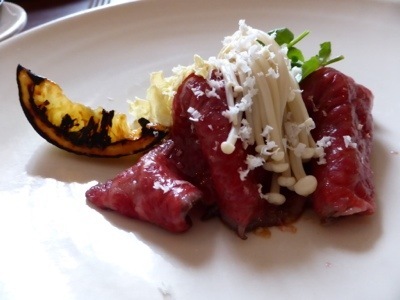 The beef is a thinly sliced Wagyu chuck tail flap, seared on 1 side and seasoned with salt and some horseradish. One squeezes the grilled wedge of lemon to separate the taste and also to get a citrusy hit. 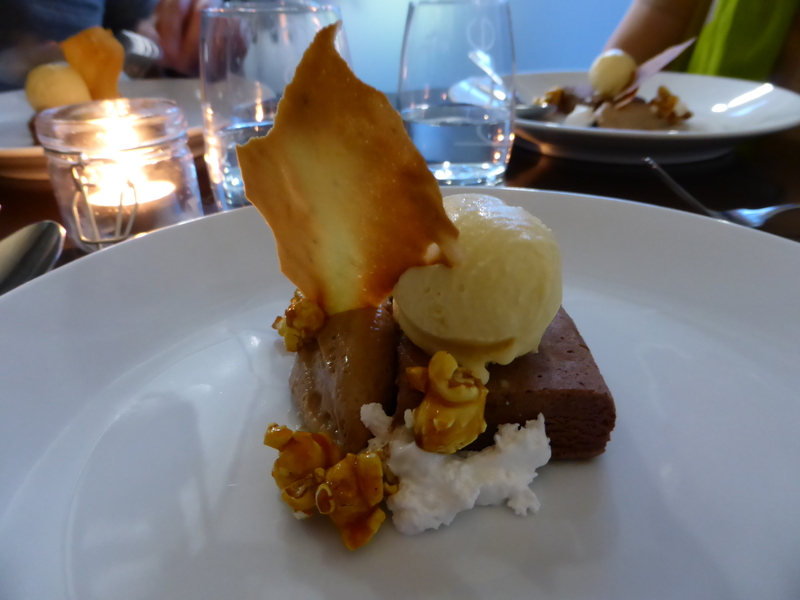 Next up were the 2 desserts, which I found rather under-whelming since I am not a fan of ‘moussey-saucey’ stuffs. 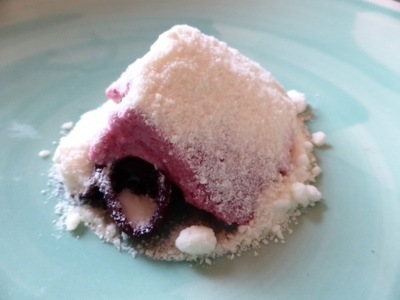 The reddish piece is quandong jelly on lemon myrtle sauce and sprinkled with frozen panna cotta snowflakes. I liked the tart taste, in particular the chewy cured quangdong which sicks to my teeth! 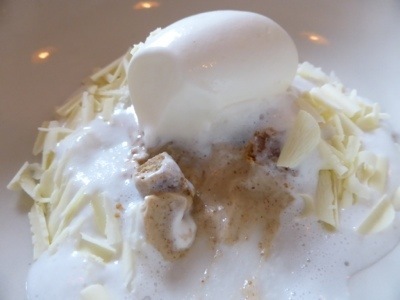 The last dessert was something akin to McVite malt biscuits under the malty white chocolate sauce, foam and shavings. 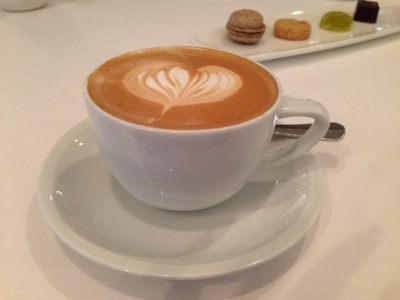 Coffees were served together with petit fours. 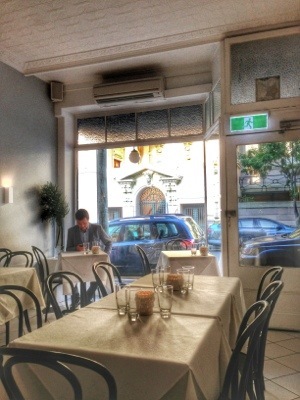 I’d definitely visit Sixpenny again – and also visit Cafe Paci in Darlinghurst the next time I am in Sydney! At the time of posting, Sixpenny scored 88% out of 130 votes. Oscillate Wildly is only a short skip opposite Newtown Station, facing the Local Courthouse and next to Black Star Pastry which is very famous for its signature ‘strawberry watermelon cake with rose scented cream’. To get to Newtown, Side-Kick Nana aka Side-Kick Chica from here – but read on why we felt our age in this dinner!) and I caught a train from Wynyard. I have not been to Newtown by public transport before, so we arranged to meet at Wynyard station to catch the train together. Lots of talking, and paying no attention meant that we jumped into the limited express train which did not stop at Newtown, we went all the way to Strathfield and had to take over a good half hour to detour back. We arrived right on the dot at 6:30pm, nevertheless! 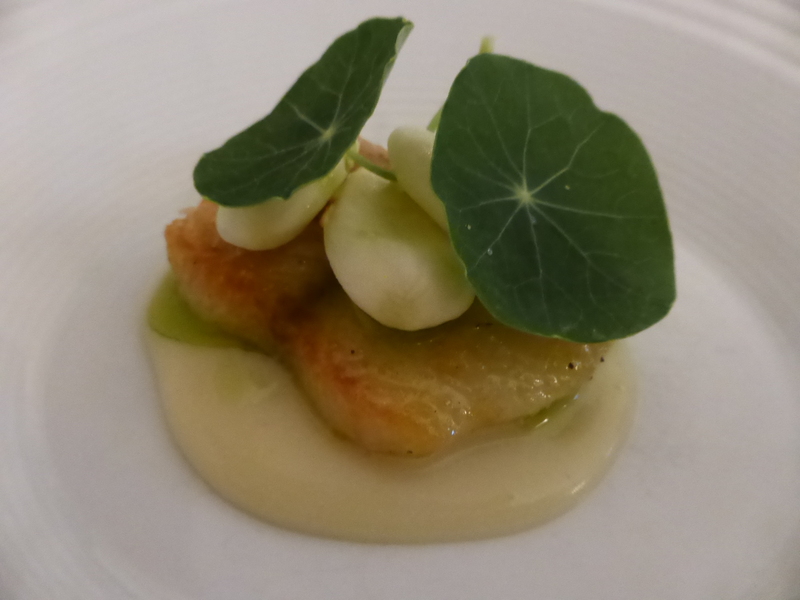 Service was polite with excellent introduction to each course and water constantly refilled. Followed by something stuck in a bowl of ice. Any takers for what they are? 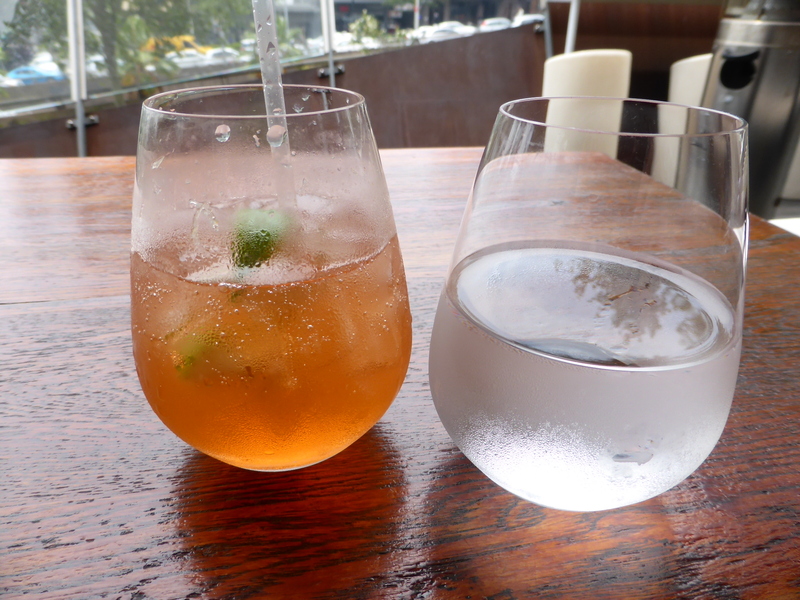 *Hint* These are 2 iconic aperitifs – served solidified! 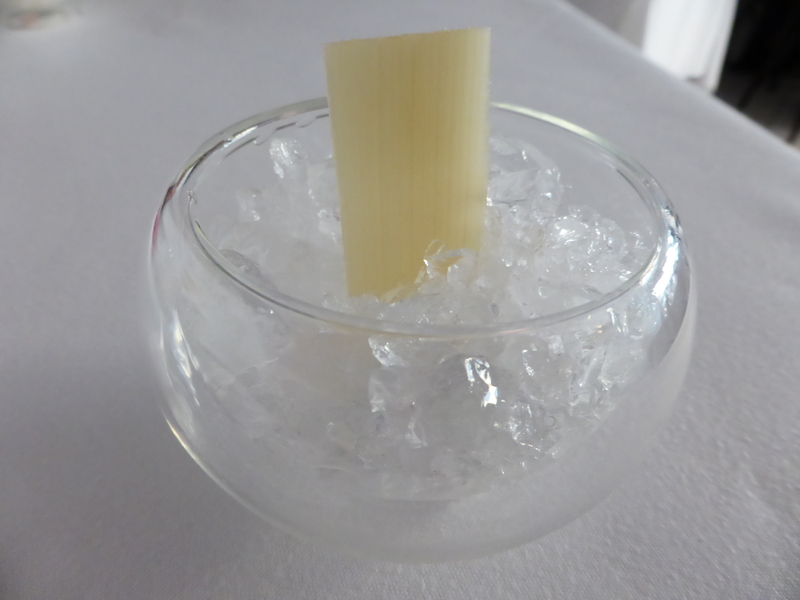 Pic #2 is the classic GT or Gin Tonic – compressed in sugar cane – no description needed! Amused by the Amuse Bouche?! Hope you were! Bread-rolls and butter were served next, accompanied by ribbons of super-salty lards that you can eat sandwiched with the roll or do what I did – eat no bread – snack on pigs’ fat all by themselves! 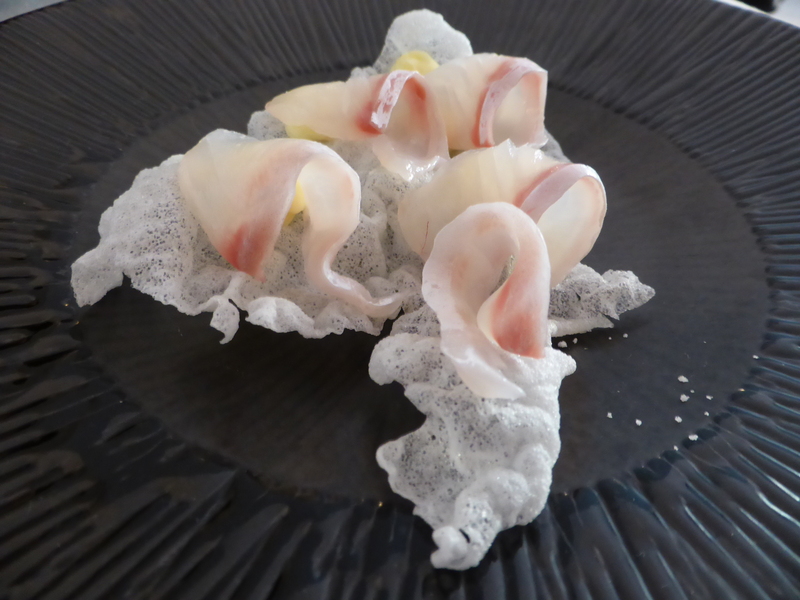 Slices of sashimi trumpeter (from Tasmania) on rice paper crackers signals the start of our degustation. The fish has beautiful firm white flesh without a very strong taste, so that was probably why it came with salty smoked butter. 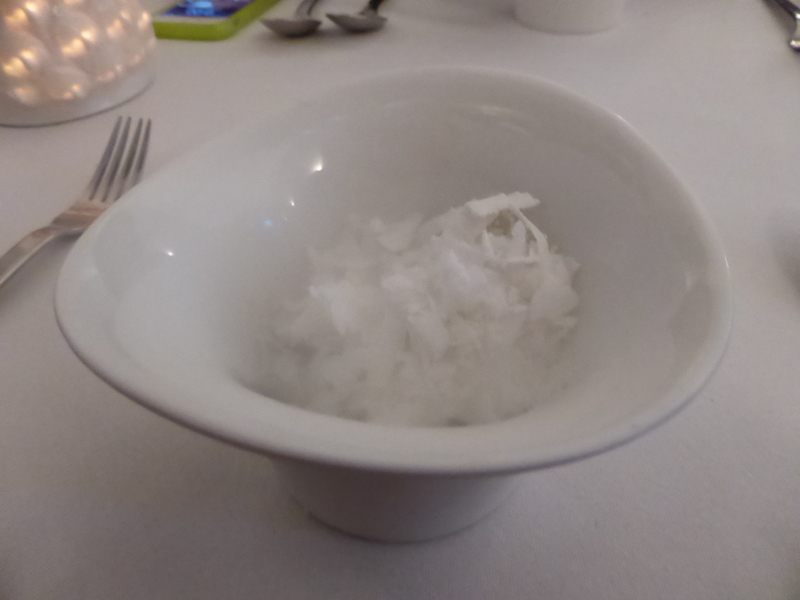 Before the 2nd Course was served, we were given hand towelettes to wipe our hands – the ever popular tablet that magically ‘grows’ and turn into towelettes when one pour water over it. 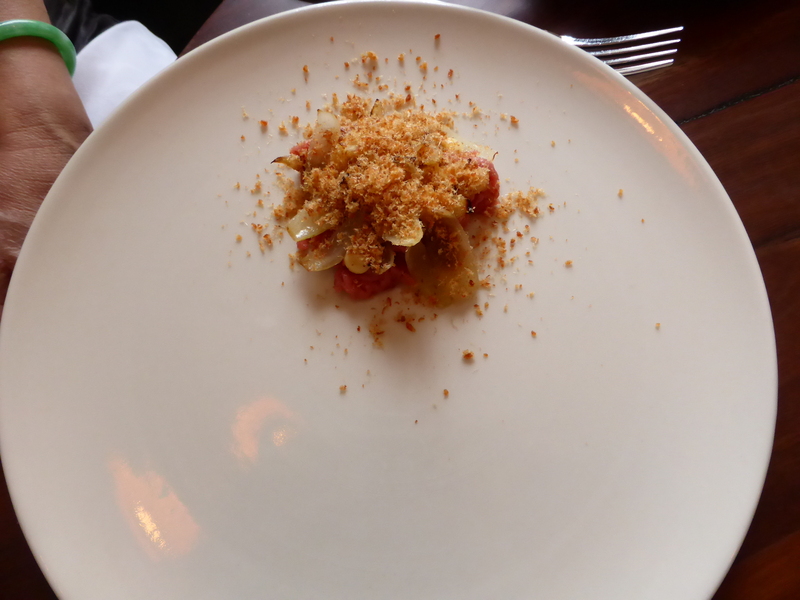 A compact goodie of freshly-planed cauliflower and Jerusalem artichoke chips stuck into the creamy foie gras custard and garnished with crushed macadamias and hazelnut powder. A faint smoky-salty aroma wafted through the room as this dish was brought out. 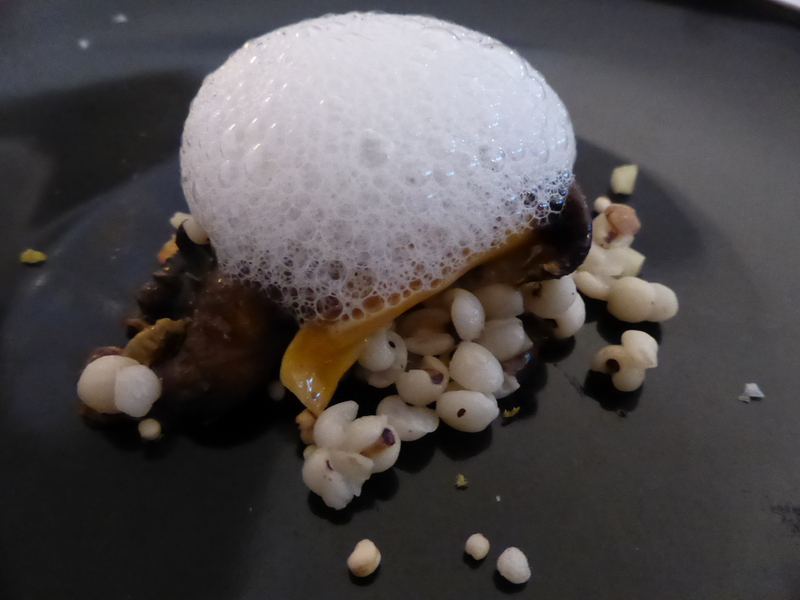 Here, we have Job’s Tears – commonly known as Chinese pearl barley – with sautéed Chanterelle mushrooms on sweet black garlic custard and bits of Appenzeller cheese. 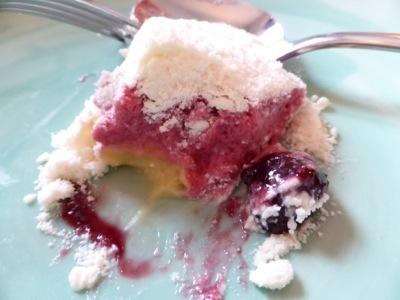 The foam of Appenzeller, a Swiss washed-rind cheese, was the ‘smelly’ culprit. 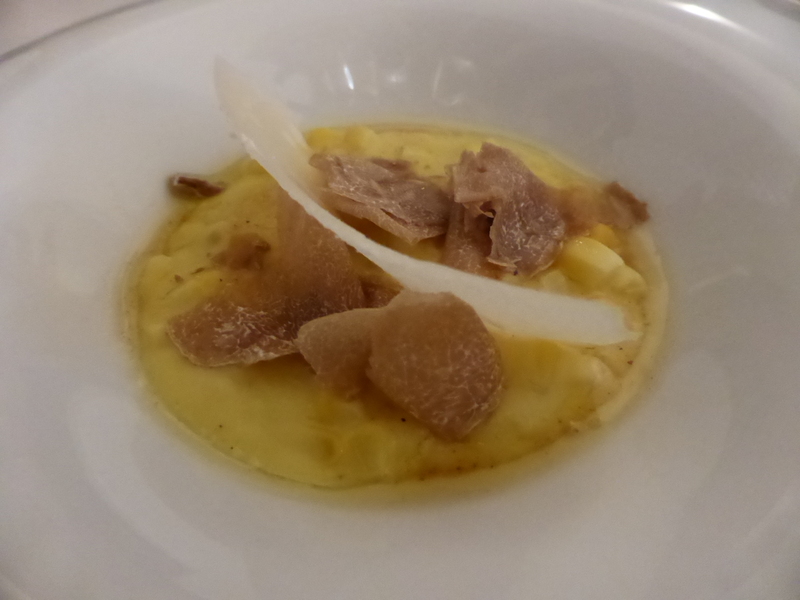 The waitress had us sold when she told us that the kitchen had received some white truffles and recommended us their special for the night: White Truffles and Polenta Sweetcorn. I found the polenta and sweetcorns very custardy and overly sweet, whereas Side-Kick Nana found it to be too cheesy for her liking. We also have a slice of percorino cheese for the extra sharpness to go with the polenta. This is SO pretty. Whenever I see fronds, it conjures up Toad from my favourite novel ‘The Wind in the Willows‘. Here, we have pan-fried Murray cod plated up with roasted young almonds (still jelly in the middle) on a bed of potato, drizzled with chive oil. 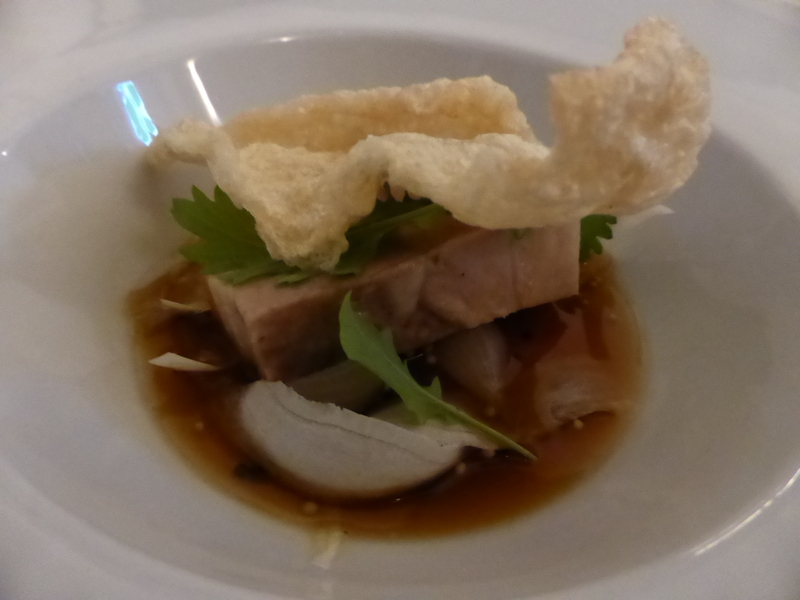 Saddleback pork belly sitting in duck broth and crowned with thin crispy crackling. 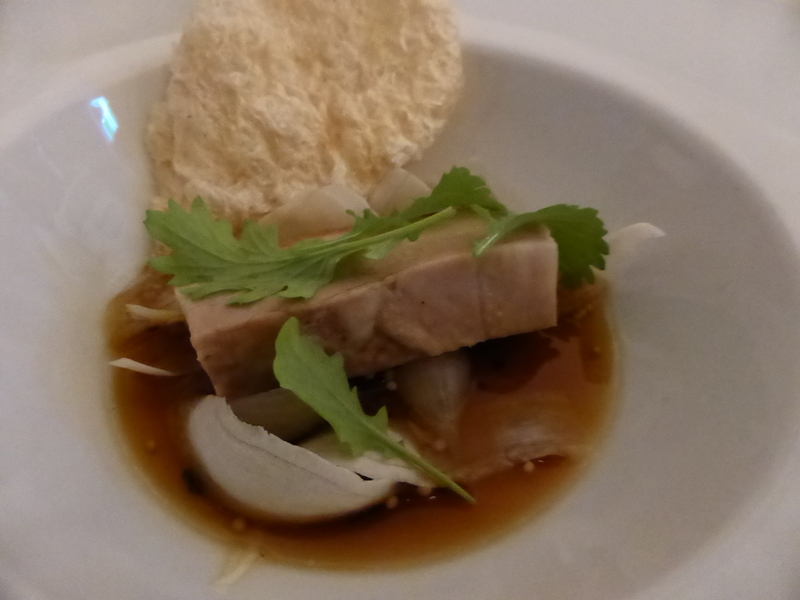 Eating the crackling by itself was bland, but dunking the crackling in the duck broth comprising mustard seeds, onions and parsley really elevated it. (The original version has prawn floss, but since I am allergic to shellfish, mine did not have any). 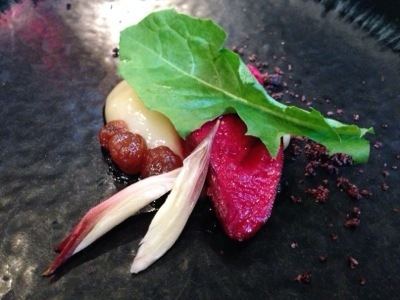 The final savoury course is tender charcoal-grilled Wagyu beef from Victoria, combined with bitter water-cress and refreshing discs of radishes. The sous-vided-almost-set egg yolk gave a blokey’s touch of steak-and-eggs to fill one up, if one is not already-surely not! Because we have been sitting and eating for 3 hours already, when enquired whether we would like to order a pre-dessert of Cheese on Toast (+$10) – a signature of Oscillate Wildly‘s, we had to decline as it was getting very late and we were both very tired -SideKick Nana is sliding off her chair and I am trying my best to keep my eyes open! 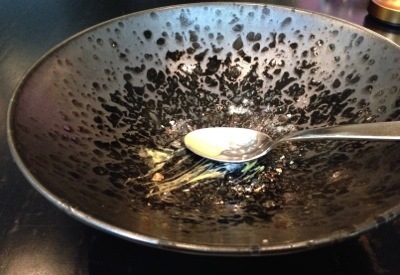 Our first dessert arrived in a white bowl with smokes blowing off it -a rather impressive entrance. 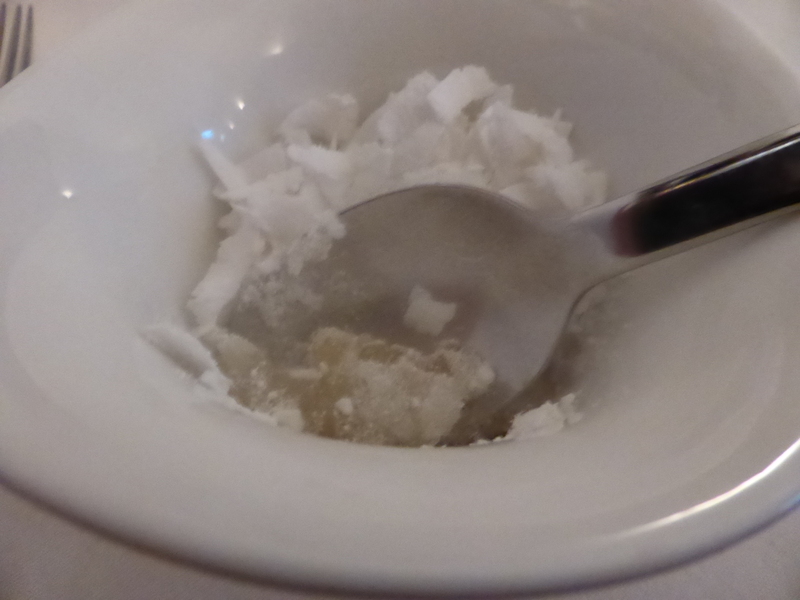 Here, we have coconut shavings on lime sorbet (very tart), under the sorbet we have the tiny pearls of tapioca and kaffir limes – influenced by Thai dessert perhaps. Nice, but not smitten by it! 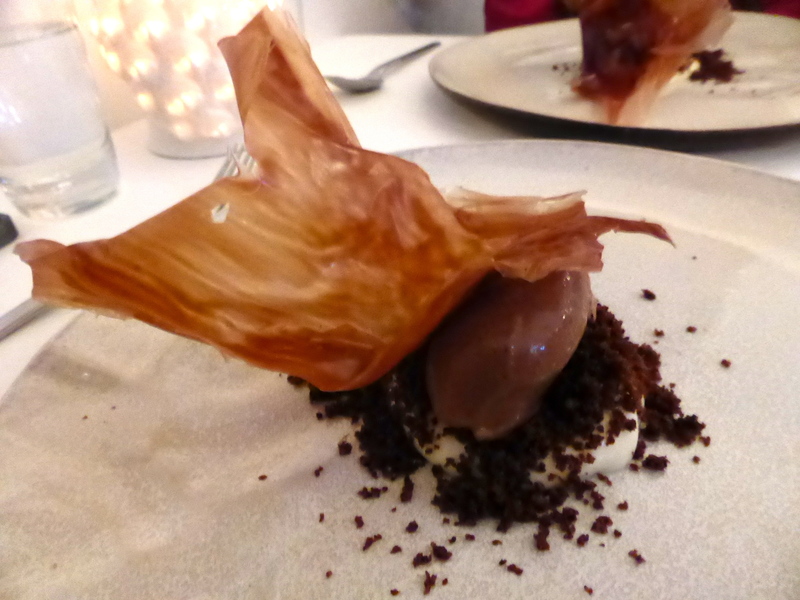 Our finale is a quenelle of Chocolate sorbet on Eucalyptus-infused mascarpone covered with chocolate soil and topped with a crunchy chocolate caramel shard. 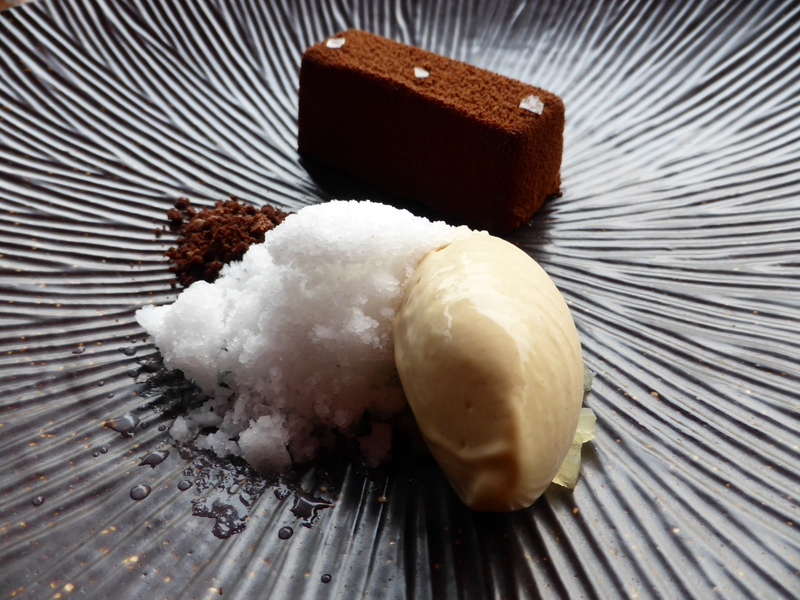 A refreshingly ‘light’ minty dessert sending us home with a high-note into the dark of the night. I must say that I have enjoyed the remake of classical dishes with a touch of molecular gastronomy designed by head chef Karl Firla . 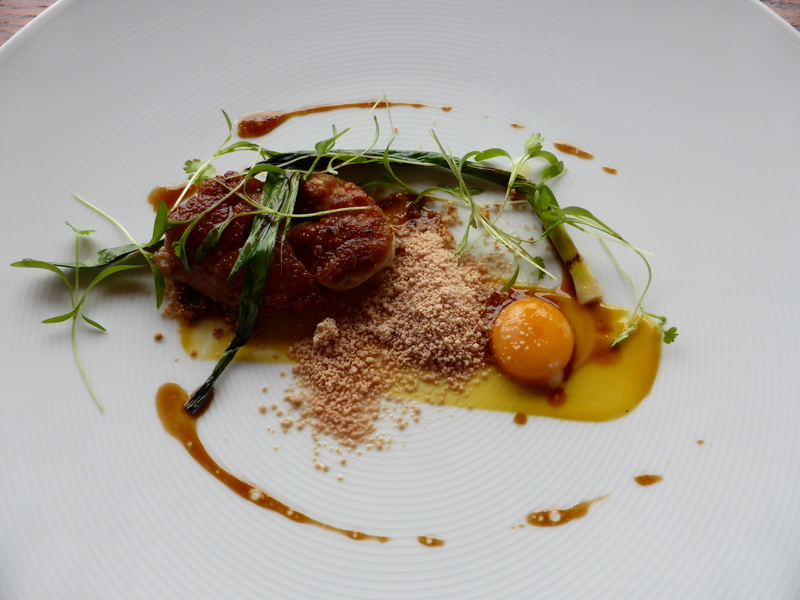 This is a spectacular degustation dinner at $100 per person. The only low-point is that the meal pacing was uneven and it took us 3.5 hours to finish dinner! 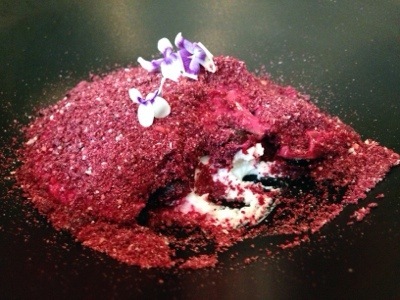 Posted in Degustation, Fine Dining, Molecular Gastronomy, Sydney	| Tagged Appenzeller cheese, Dehydrated Kir Royale, Haw Flakes, Job's Tears, Lard, White Truffles, White Truffles and Polenta Sweetcorn. Thought I’d spend a nice day at home packing before I take-off again tomorrow but that was not to be… a last minute call to show up in the City for a meeting came at 9am, so off I went to the City – but before that, a quick call to make a reservation for lunch at est.! est. 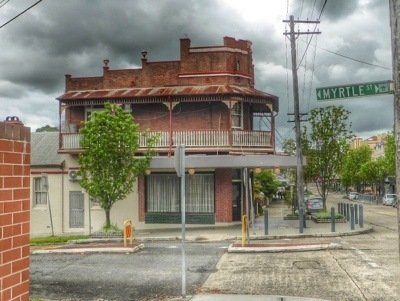 is a 3-hat restaurant in the city, head-chefed by Peter Doyle – is he related to the famous Doyles fish and chips joint in Watsons Bay, I don’t know. All I am sure of is that at this moment, they are running a $69 2-course lunch deal. est. 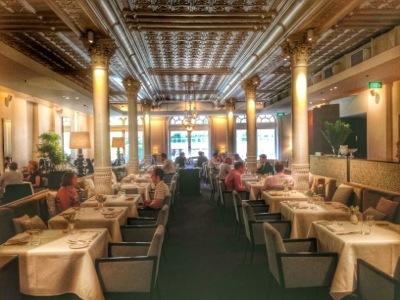 is a firm favourite with the suiters crowds, set in a heritage room with highly decorative ceilings supported by luxe corinthian colums. 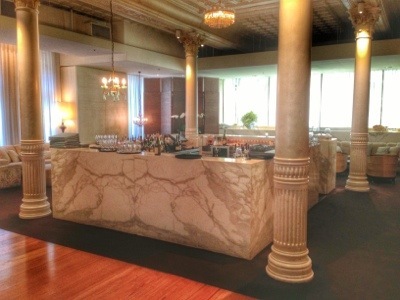 As soon as we were seated, a champagne trolley was wheeled over to take our champagne orders – which we declined. 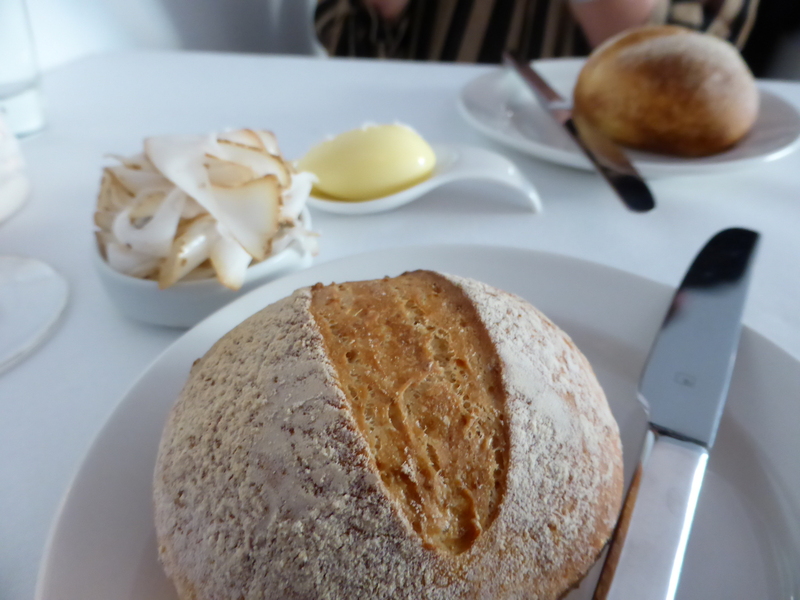 With our lunch order taken, a bread sommelier showed us a tray of breads, there were choices of sliced linseed bread, rye or sourdough dampers. 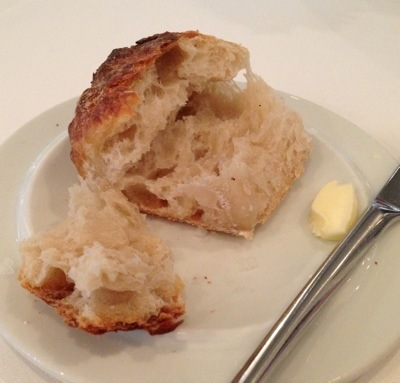 I chose the sourdough damper which was somewhat disappointing being cold. 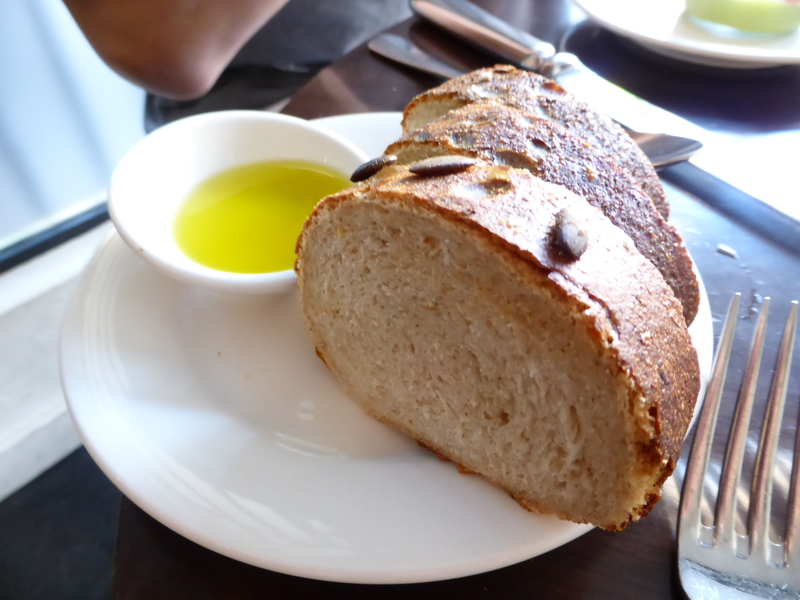 I am sure I would have enjoyed the bread and finished it if it was warm! 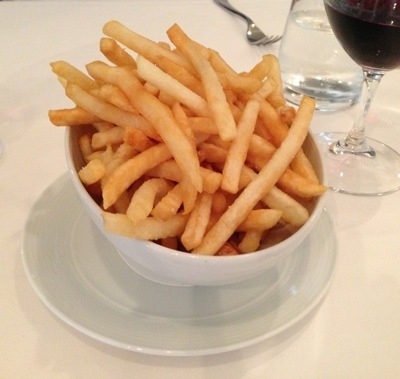 A bowl of chips as starters! Hot and crunchy with fluffy insides, perfect accompaniment to my 2010 Niepoort ‘Sempar’ from Douro Valley, a Touriga wine varietal from Portugal. This is a medium-bodied, plummy-tobaccoey, dry tannic wine which opens up after decanting. This is seriously the best wagyu sirloin I’ve came across – meltingly soft-tender-fatty beef from Tassie! 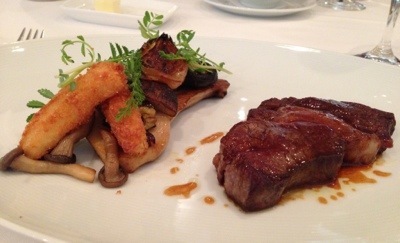 Paired with the beef is an assortment of 4 very delicious grilled mushrooms. 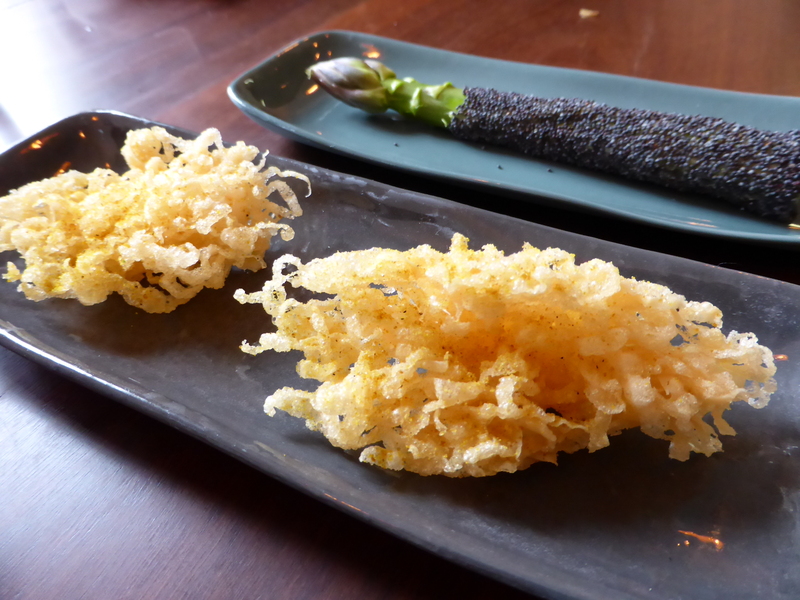 The 2 deep-fried crumbed sticks were turnips, I presume… the shiso leaves added both colour and a bitter kick. As always, dessert is a highlight. 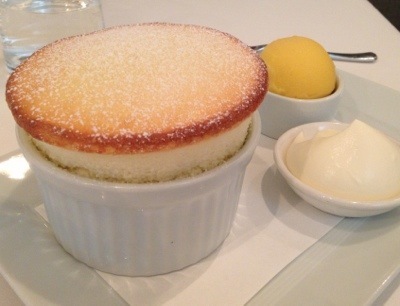 My dining companion chose est.’s signature dessert, the Passionfruit Soufflé. 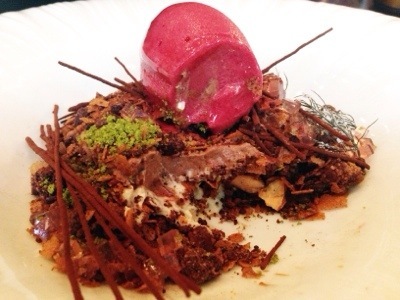 It was very, very sweet – too sweet to finish. 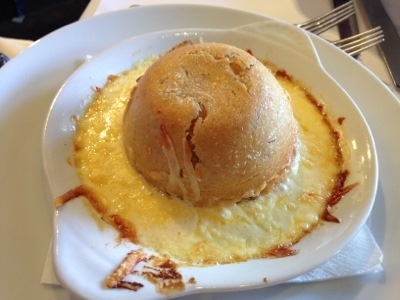 A pity since it had risen up to a perfectly formed soufflé. We finished with coffees and complimentary petit fours. 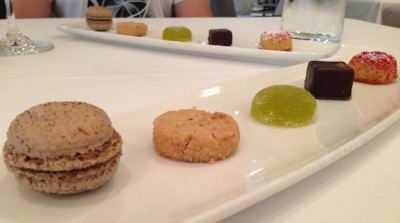 I enjoyed the malt-rye macaroon and the crunchy sea-salt peanut cookie, not sure about the green-colured gelée and the chocolate (which had fennel seed gelée in it). All-in-all, a perfect and very satisfying lunch! Well, with my review done, I am going back to finish my packing now. Do you find that half your luggage is always taken up by computer cables? Anyway, if I forget anything, there is always online shopping! Dining out when one is on a pseudo-diet is kinda hard. How do one choose what to eat from the long list of deliciousness? E-A-S-Y! That is, if one has a checklist of what one can and cannot eat – i.e. a limiting factor as a guidance to make choosing off the menu a breeze. The French Onion soufflé smelt very good, exactly like the french onion soup except in the pudding/ soufflé form and surrounded by grilled cheese. Totally decadent…mmm… but of course my mind started berating: “Do you want to jiggle like the soufflé?” My strategy was to satisfy my inner cravings by inhaling deeply …ommm, namaste! 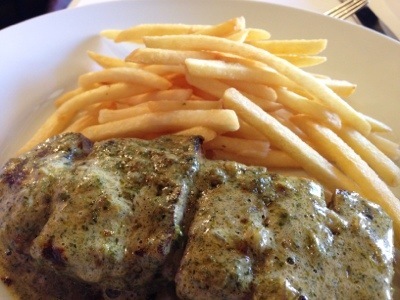 Finally, plates were cleared, our Mains arrived. 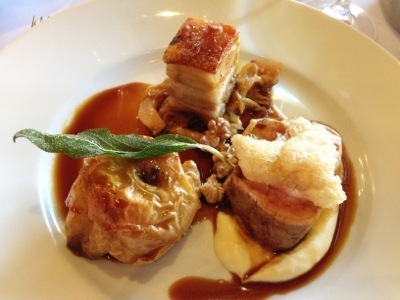 My ‘pre-occupation’ was in the form of the delectable Pork Belly & Pork Loin paired with baked apple, walnuts and braised savoy cabbage. I practised mindful eating at this point – slowly devouring and savouring each mouthful of the perfectly cooked and very succulent pork. You know what? Baked apples is so much more filling than apple sauce, and it was nice to be cutting up the apple and spreading it on the meat! Since I took a rather long time to polish off my meal. We were not tempted by the desserts – the limiting factor here was the 2 hour car parking – we did not want a ticket from the parking ranger! As you can see, strategic planning by arming oneself with limiting factors such as what one can or cannot eat, not wanting a parking ticket; the right mindset; cueing with visualisation and eating mindfully played an important role over my lunch today. Practise it often, and one can survive a darn good lunch! Like most ambitious young chefs, Chef Tomislav Martinovic went abroad and worked in many kitchens including the highly esteemed Heston Blumenthal’s. 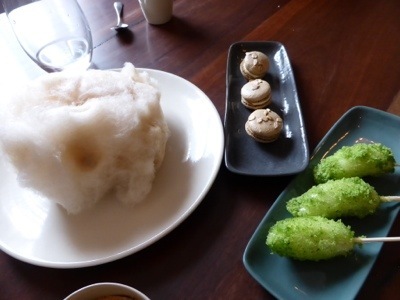 So when my friend, Side-Kick Chica (she writes a travel blog here), said that she missed out on dining at Fat Duck when she was in UK recently. I told her we have a Fat Duck alumni here! No need to travel all the way to Bray in Berkshire county – a 50 minutes journey from London’s Paddington Station and why bother figuring out the logistics and lodging simply for dinner?! Duh!! 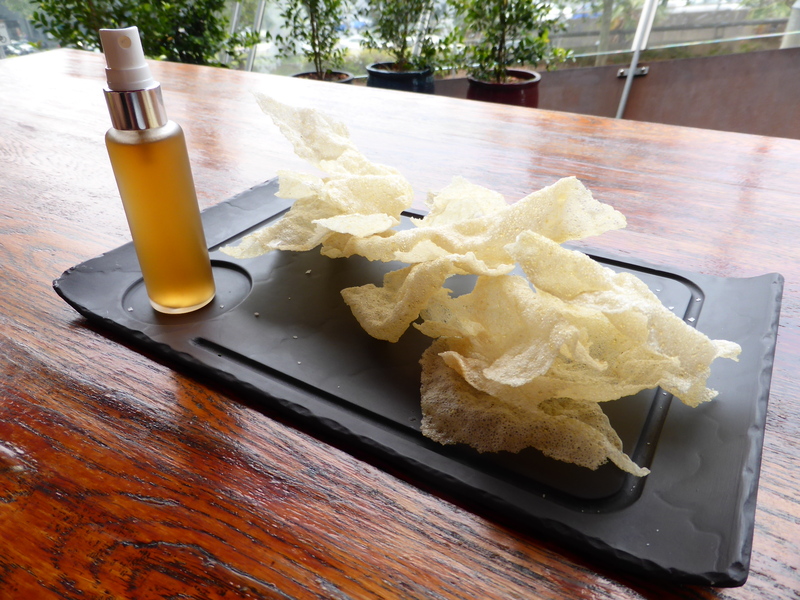 As we waited for our 1st course, we snacked on rice crackers with sea salt (+$10) which we spritzed vinegar from an atomiser – so deft! 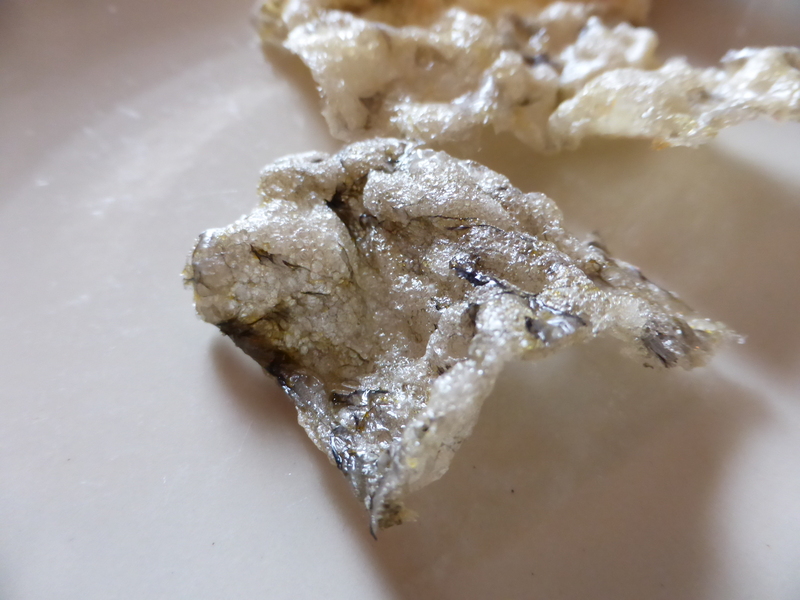 The rice crackers were apparently “simply brushed with egg white and deep-fried for two to three seconds, resulting in paper-thin scrunches that look like dropped hankies. They stay crisper than crisp even when sprayed with the little atomiser of vinegar, a move nicked straight out of Heston Blumenthal’s kitchen/laboratory” (much quoted sentences from food blogs). 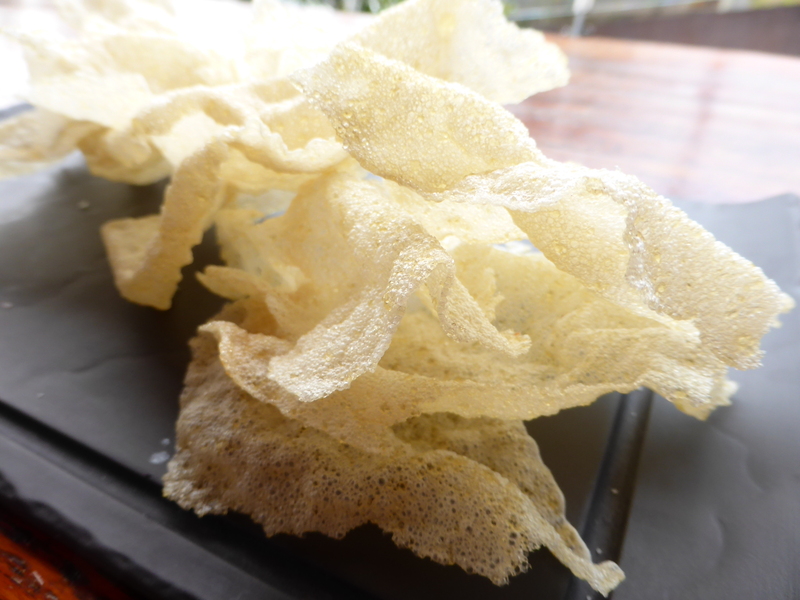 Rice crackers with sea salt and vinegar. The affable Ann- Maree, looked after us well. 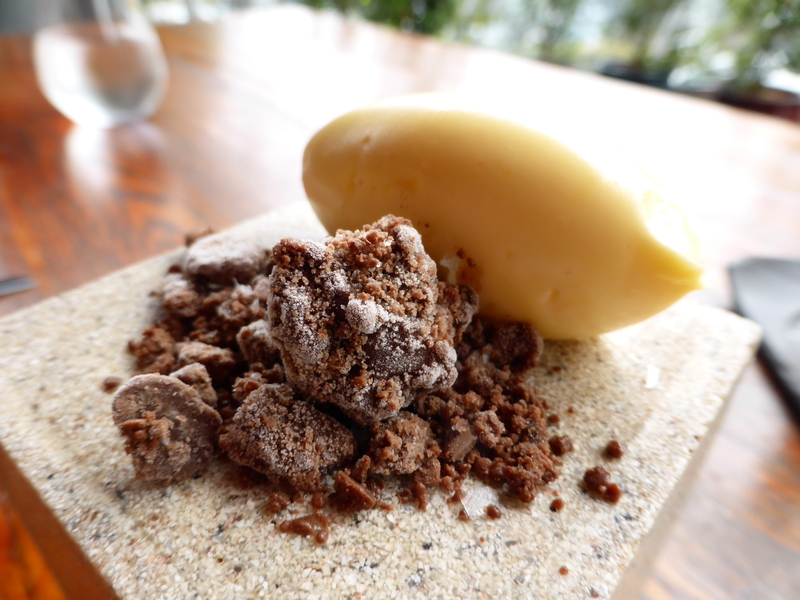 We had house-churned butter and frozen chocolate presented on a granite plinth accompanies our complimentary sour dough. What a kooky idea to blend choc-ice with butter! Interesting chocolate bread idea, but I preferred picking and eating the choc-ice instead! Our Amuse Bouche was the triple cheeses onion toasties. 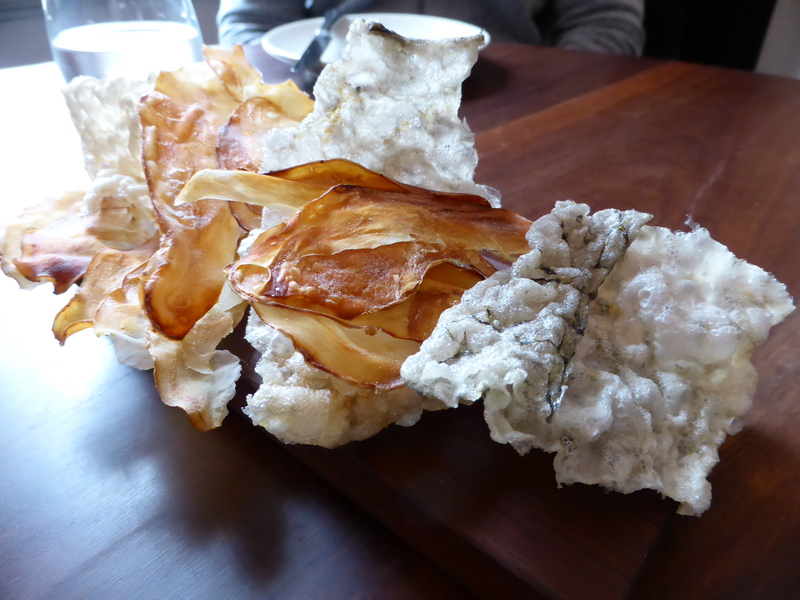 The cheeses were marshmallow-ishly soft and tasted cheesey, accentuated with bits of caramelised onions and fragile crackers. 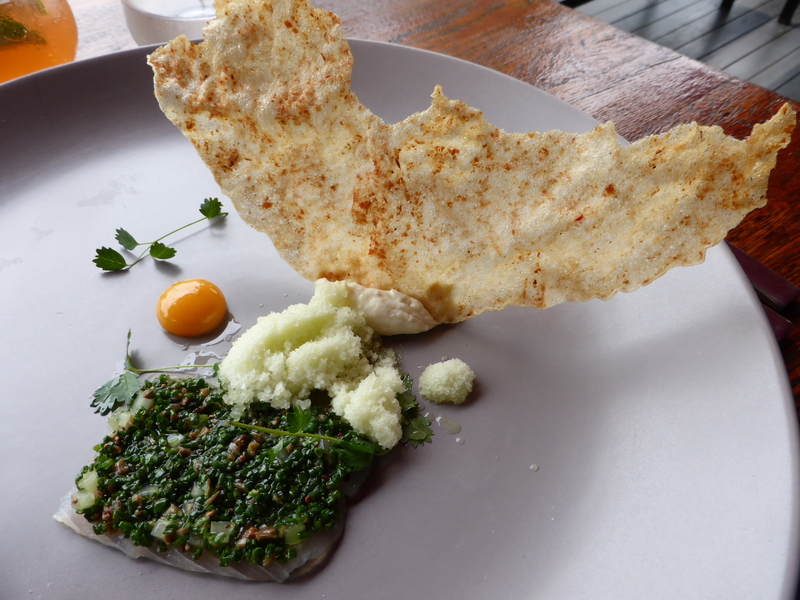 My Choice (Kickass Chica): A light summery dish of thinly sliced Spanish mackerel carpaccio covered in finely chopped salad of burnett – the herbs tasted very fresh, reminiscent of cucumber – and when paired with celery sorbet makes a good transition to the crackers held in place by creamy mackerel mousse. Should I have broken the quail’s egg to mix with the carparccio? I am not sure since it is ALWAYS my habit to always eat the yolk whole without breaking it. (Both Side-kick Chica and I had the same course). 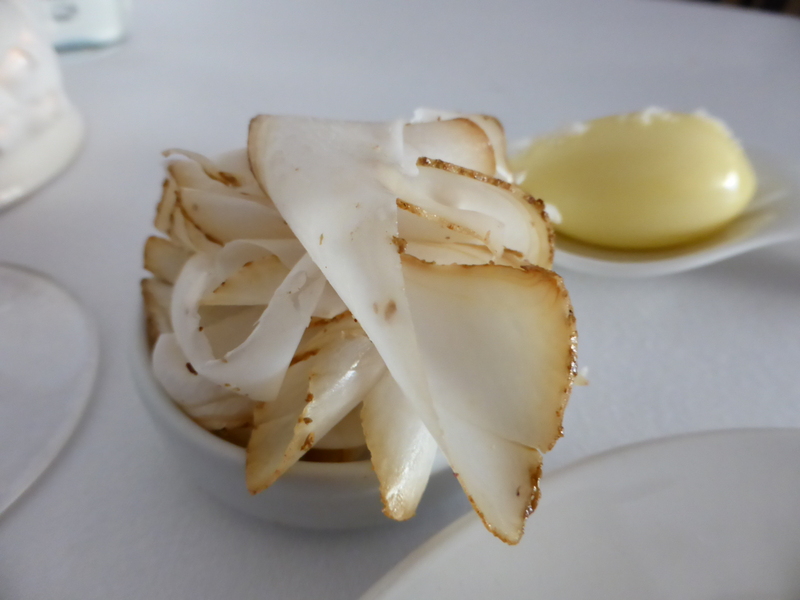 The pairing of coconut pudding with the roasted Riverina lamb neck piqued my interest so I decided to order it to see how well they matches. Overly contrasting and perhaps mismatched, I can only describe the pairing as ‘interesting’. 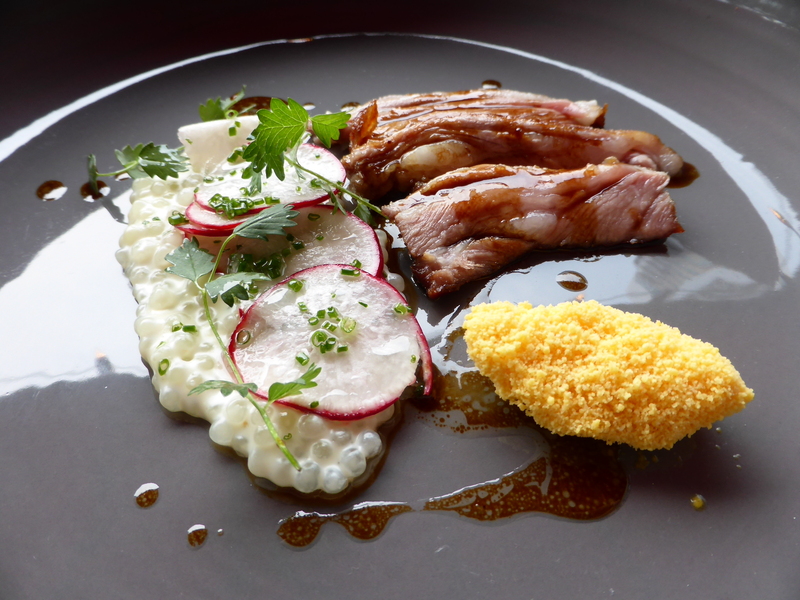 The lamb neck was faultless but I ate the coconut pudding – basically tapioca sago cooked in milky coconut – separately as dessert. Hmm… we have another play of the ‘frozen and crumbed’, now in the form of frozen mustard. 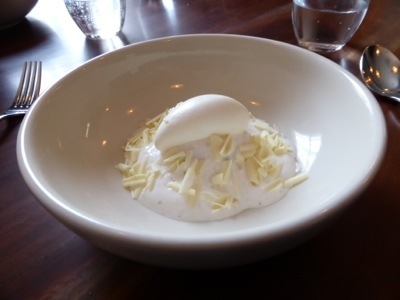 My Choice: I had the lemon cheesecake which Tomislav described as his perfected version of Wow Cow yoghurt. 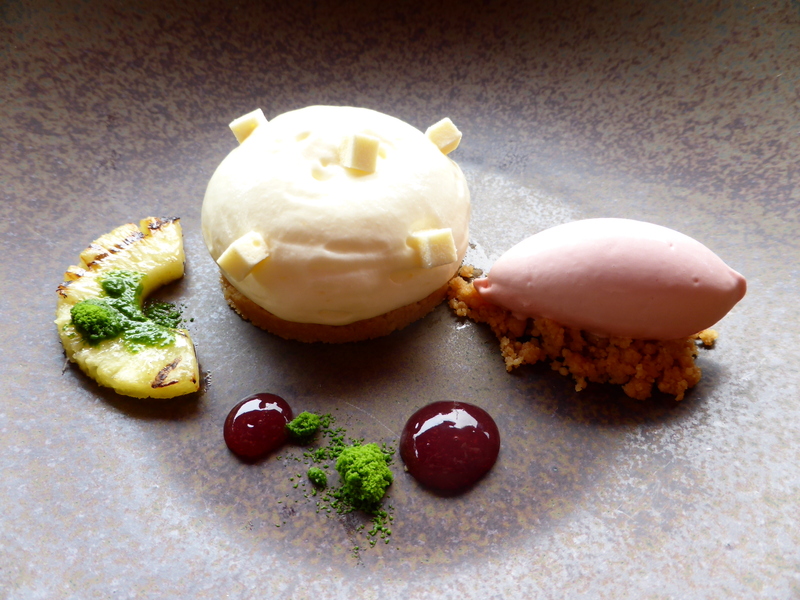 An interesting deconstructed cheesecake with lemon mousse studded with cheese on a sable base; a pink quenelle of strawberry sorbet sitting on the crumbed sable with salt; green frozen and crumbed mint on the yellow grilled pineapple – added a contrast of colours to the dish – oh, and not forgetting the 2 deep-ruby berry drops on the plate. 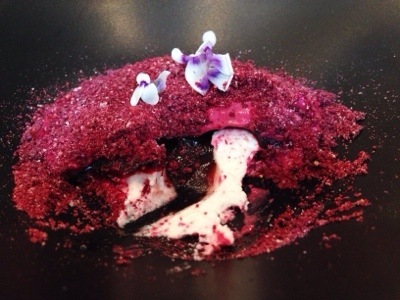 It was definitely a very technique-driven lunch of flavoured frozen crumbs on hot dishes. 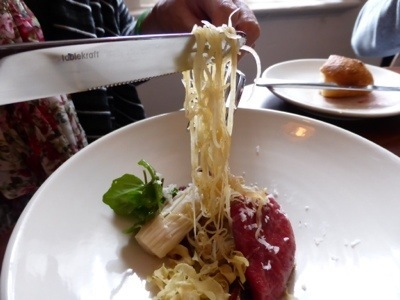 I am sure Chef Tomislav had made good use of his paco-jet machine to the delight of us all, his customers! While browsing though my pictures, I was thinking how the choice of plates made for interesting and psychedelic plated dishes! At the time of posting, Tomislav scored 91% from 136 votes! Ever thought of naming your restaurant after your favourite game? Well, Chef Paul Cooper did. 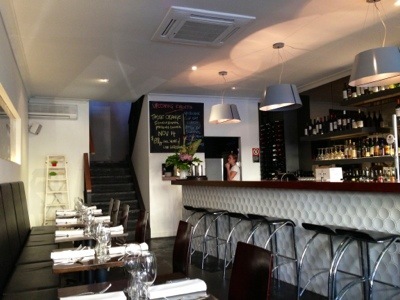 His restaurant at 527 Crown Street, Surry Hills is named after Sessa, the inventor of the game of Chaturanga, an ancient Indian strategy game which is the common ancestor of the board game of chess which he is fond of. 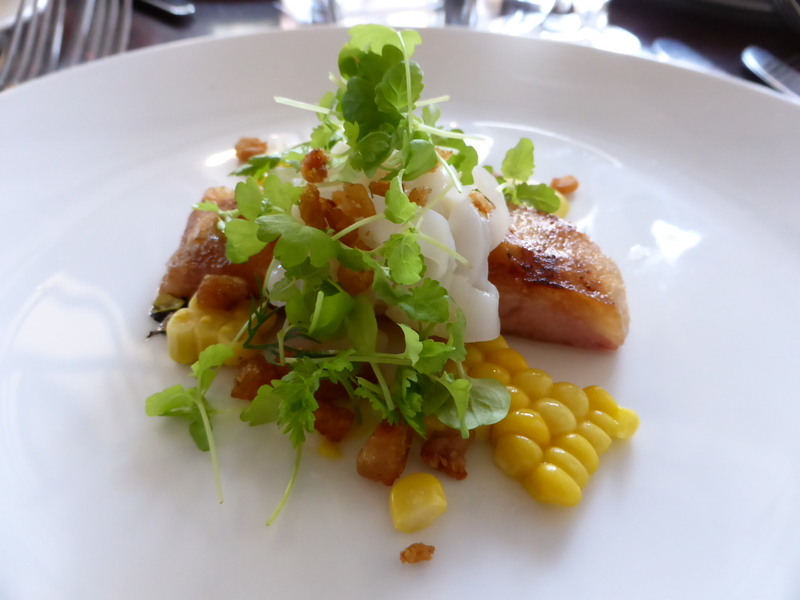 Tonight’s night-out was a 6-course dega meal ($69). I did not opt for wine matching this time because I was on a ‘diet’. Nevertheless, dinner is not dinner unless there is a glass of wine, so lieu of 6 glasses of wines for wine matching (+$50), I ordered a Spanish white -Marques de Tezona Macabeo ($7.50) – which was rather dry and quite minerally. 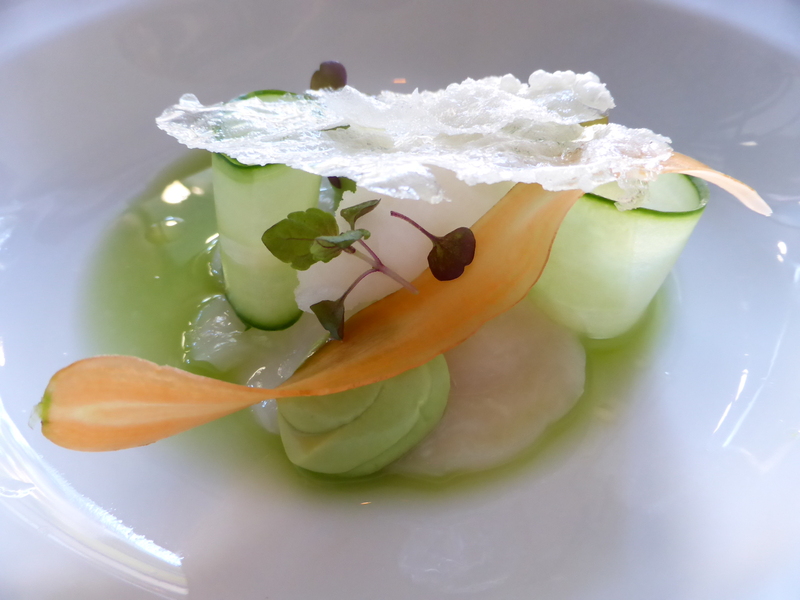 Course 2 mimicry the arrival of summer with its appetisingly refreshing smell of fresh cucumber juice. 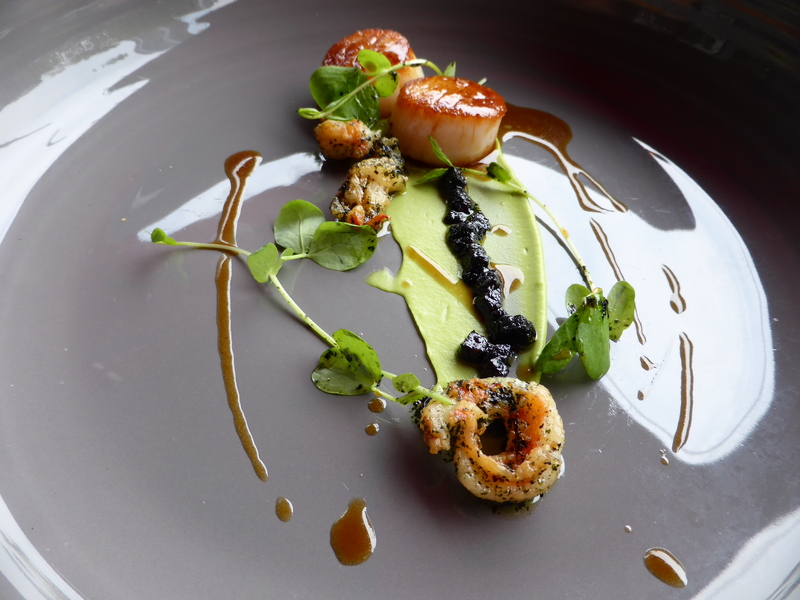 Creamy scallops and creamy avocado paired with icy cold ginger sorbet hidden under the wispy rice cracker. 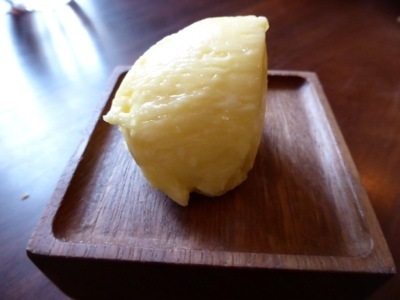 I particularly enjoyed the sorbet for its Japanese-pickled-gingers-taste served at the sushi bar. 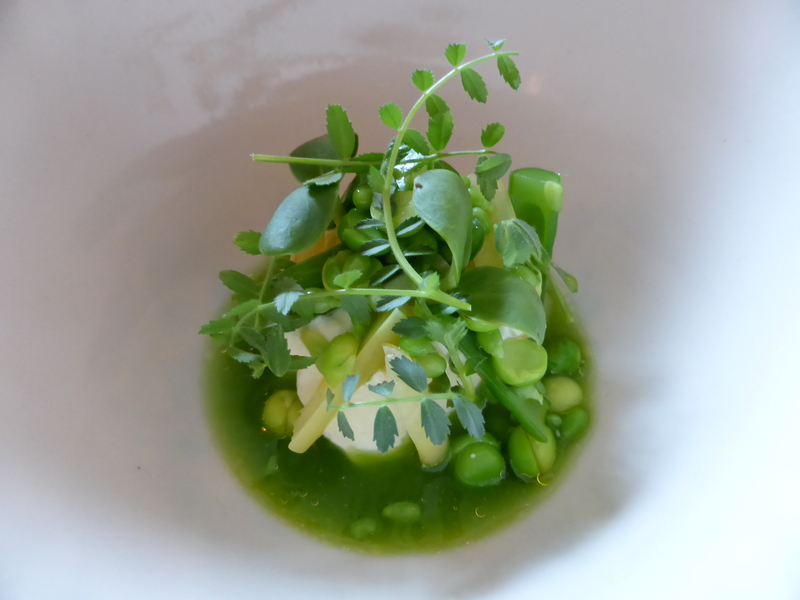 A very refreshing and neat dish that I simply had to lap up the cold cucumber juice. 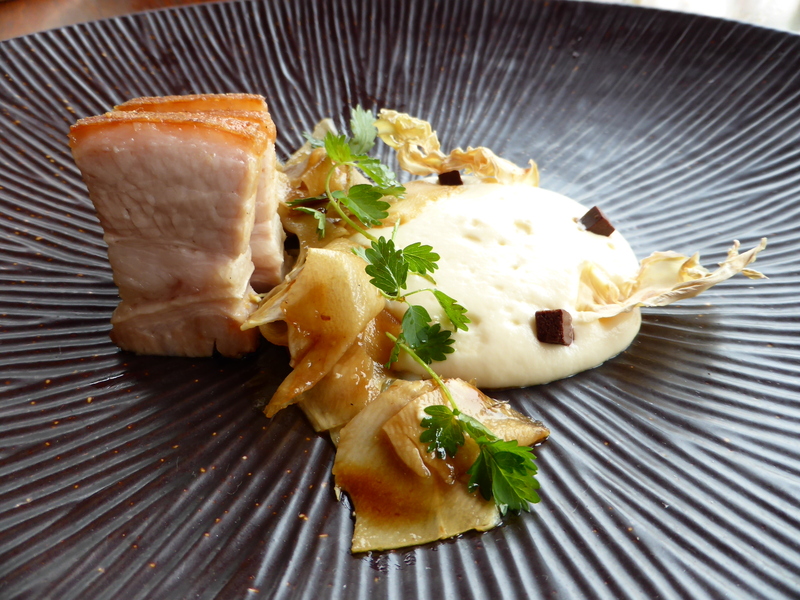 The pork belly has to be the best pork belly we had ever eaten! A hot fatty piece of meat with perfect crackling that literally melted in our mouths! 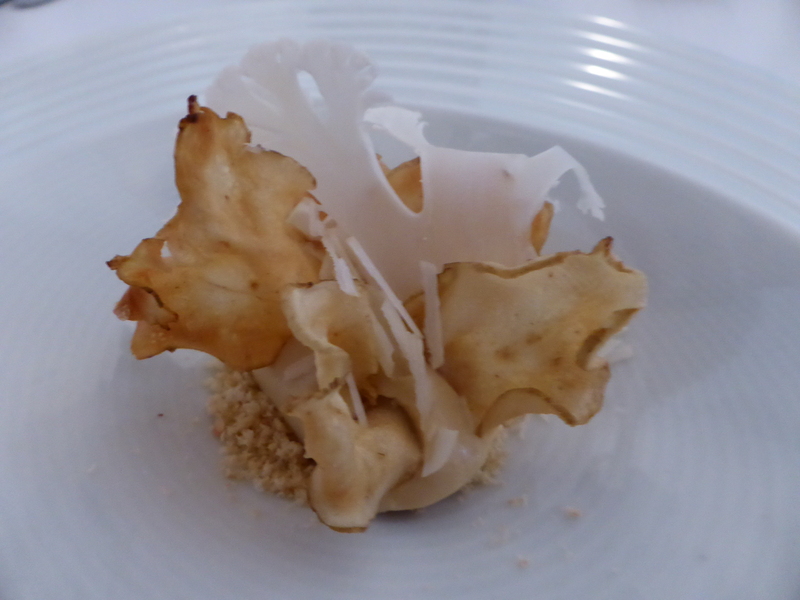 The pickled calamari sliced thin like fettucine was a palate cleanser with its pleasant acidity. 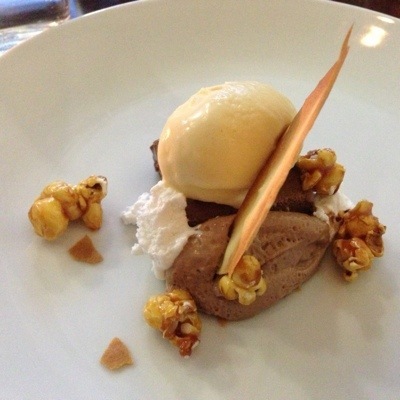 The sweetness of corn kernels rounded out the flavoursome combination. 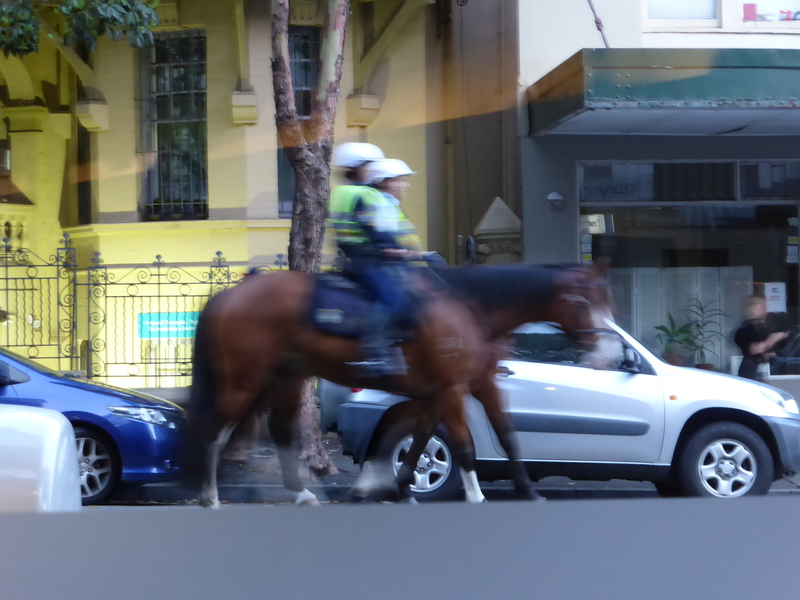 While waiting for Course 4, we saw The NSW Mounted Police on their horses. By the way, do you know that The New South Wales Mounted Police Unit is the oldest continuous operational mounted unit in the world? Fancy that! Check out their website (here) for free tours and museum visits every Tuesdays and Thursdays. 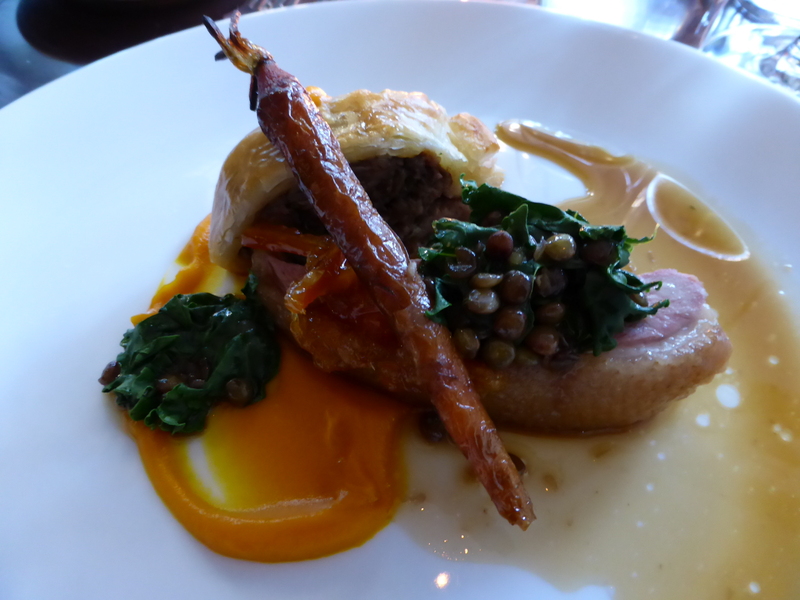 We moved into the heavier French-inspired course 4 for our duck cooked 2 ways – roasted duck breast and confit duck sausage roll. 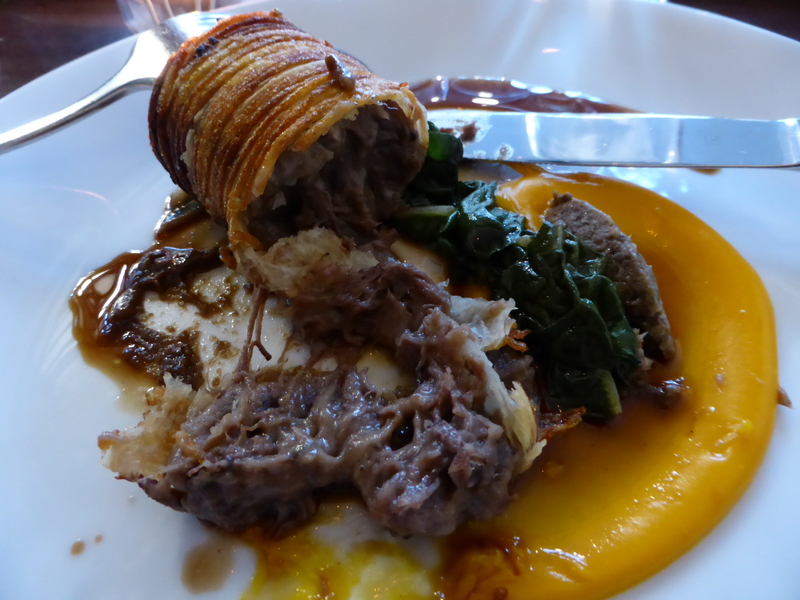 Whilst I enjoyed the duck breast paired with the orange & onion marmalade jam with slivers of orange peels, I found the duck in the puff pastry too gamey for my liking. 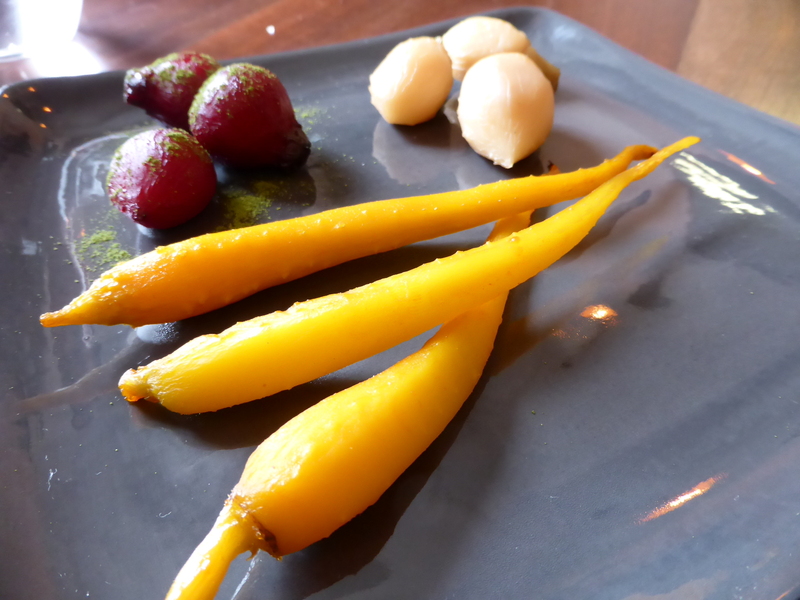 The roasted carrot in balsamic was interesting. 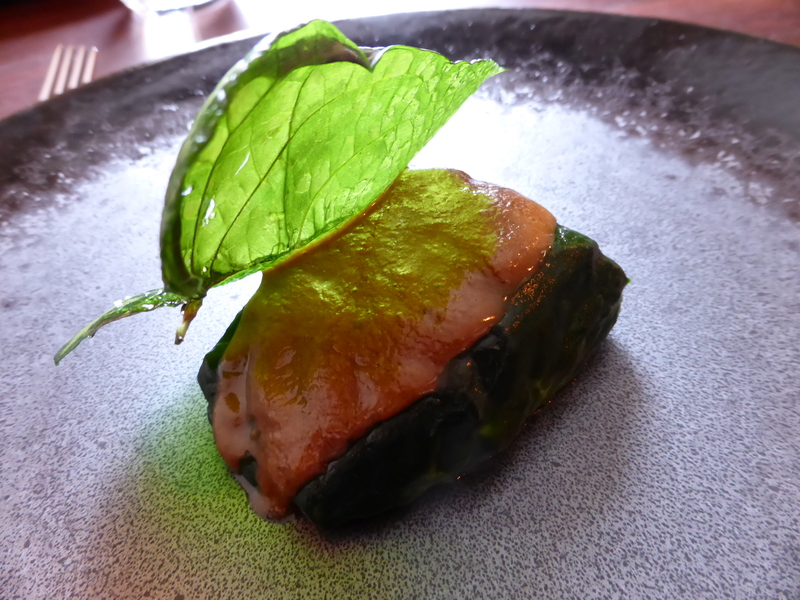 The Wagyu course had the same accompaniment as the duck course, which are sauteed silverbeet (cooked in balsamic reduction?) and pumpkin puree. Unfortunately, very lackluster being overly sweet. 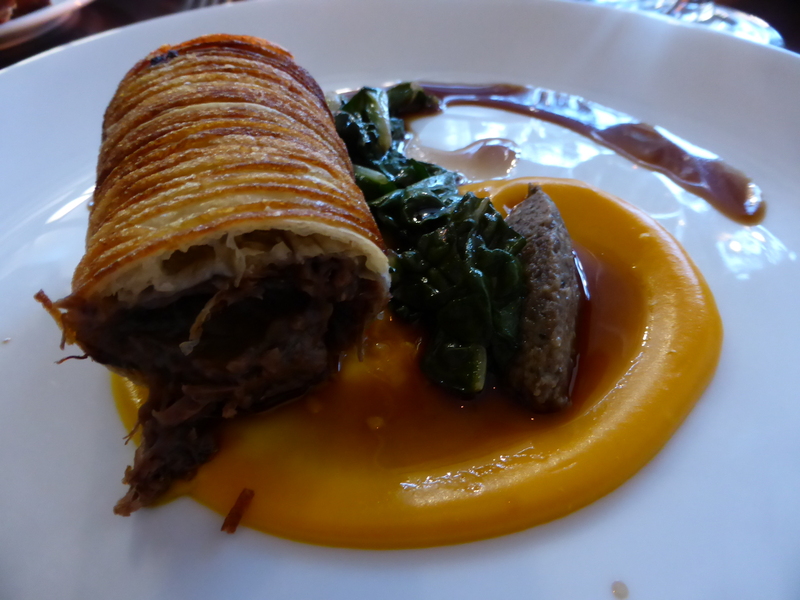 The ‘steak’ came packaged in biscuit-like potato pastry, it was bits of pulled beef seasoned in herbs, but liven up by the vinaigrette-y, mushroom pate. 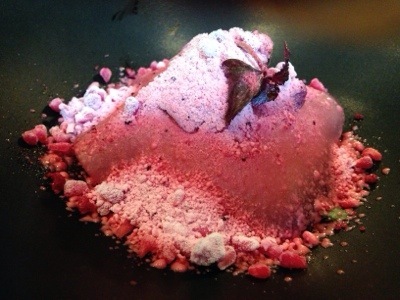 Dessert was a course I could – and should – do without! But hey, it’s a Friday night – chillax – so I devoured chocolate mousse and brownie – cleaned the milky ice-cream and the works! I couldn’t recall anything special about this dessert except the marshmallow tasted weird in grainy sugary texture. 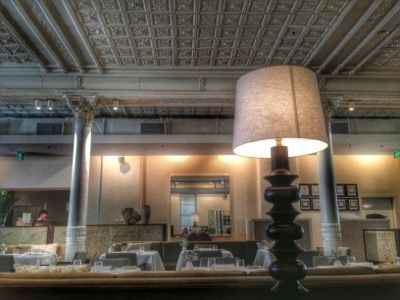 If you are looking for fine dining in the area, I will suggest Bishop Sessa.